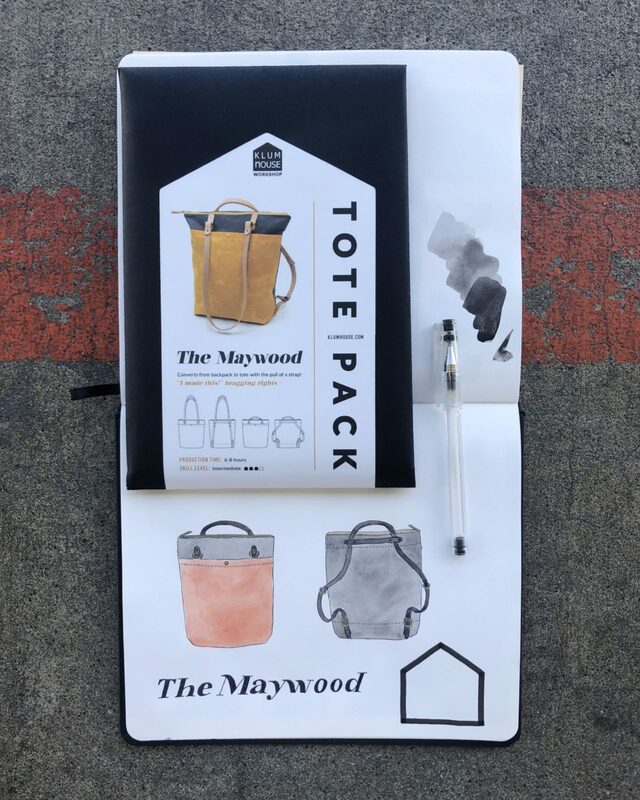 Back in December of 2018, Klum House reached out to ask if I’d be willing to make the relaunch of their Maywood Totepack once it was ready. 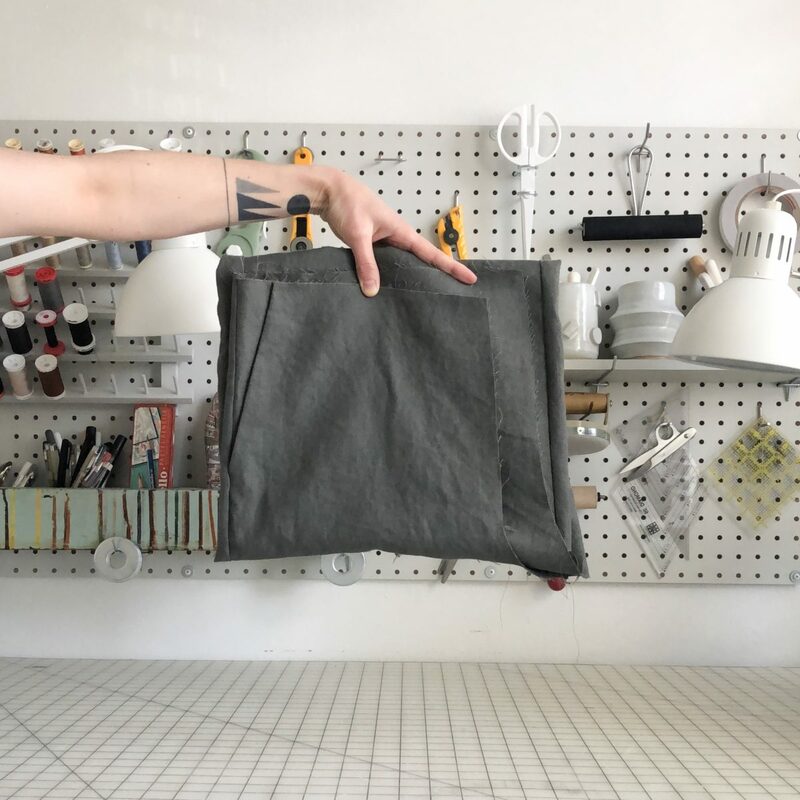 I had already made their Dopp Kit and had recently purchased a Finishing Kit for the first Maywood pattern, so I was definitely on board! 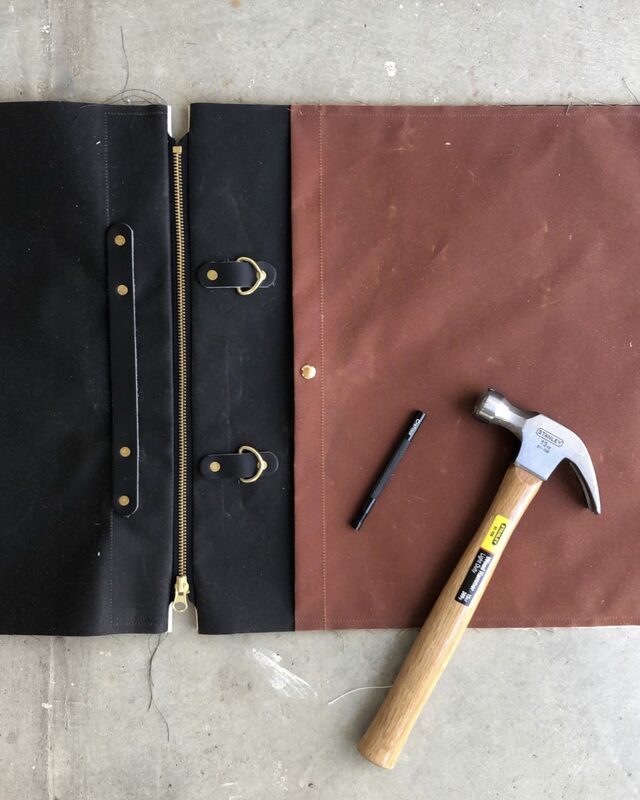 The Maywood is not only a classic bag you’ll use for years, but its making process teaches you clever construction techniques and satisfying hardware setting skills. 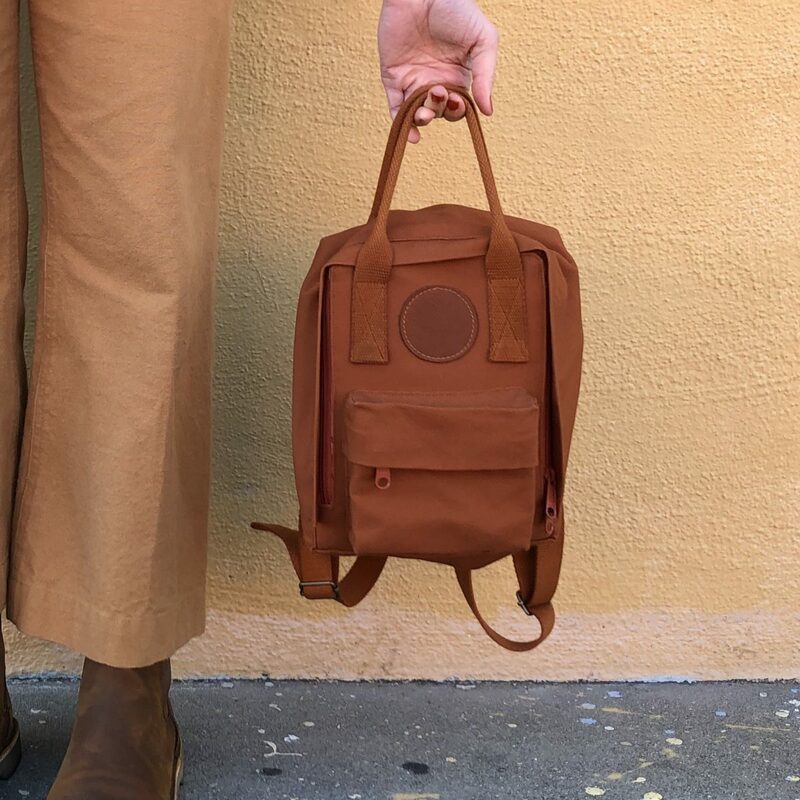 If you’re looking for a versatile bag with top notch finishes, look no further, the Klum House Maywood Totepack is for you! 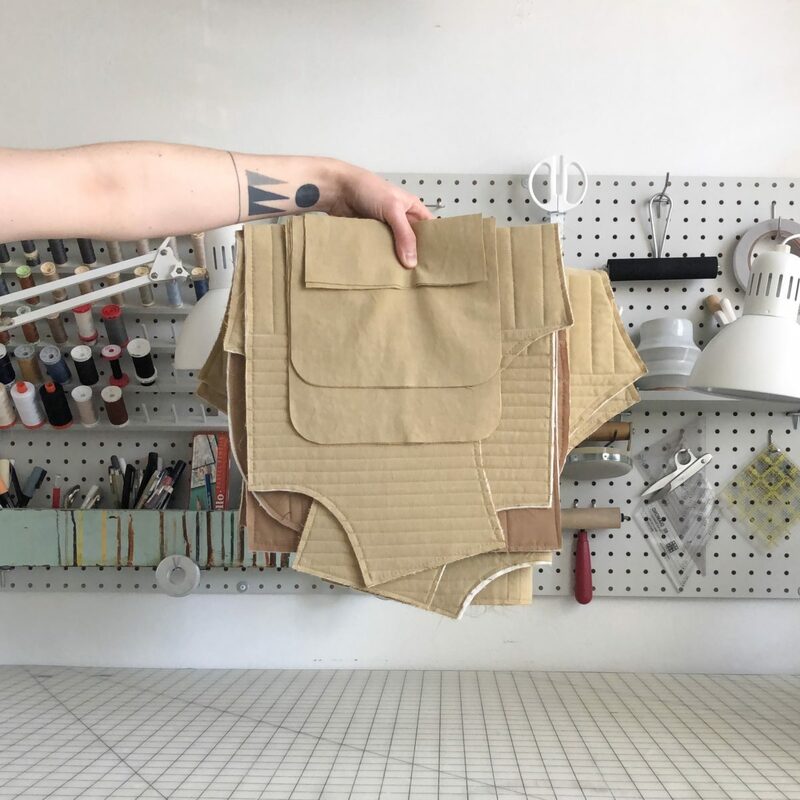 FABRIC & MATERIALS: Maywood Maker Kit, comes with EVERYTHING you need AND the fabric is already cut out and marked! 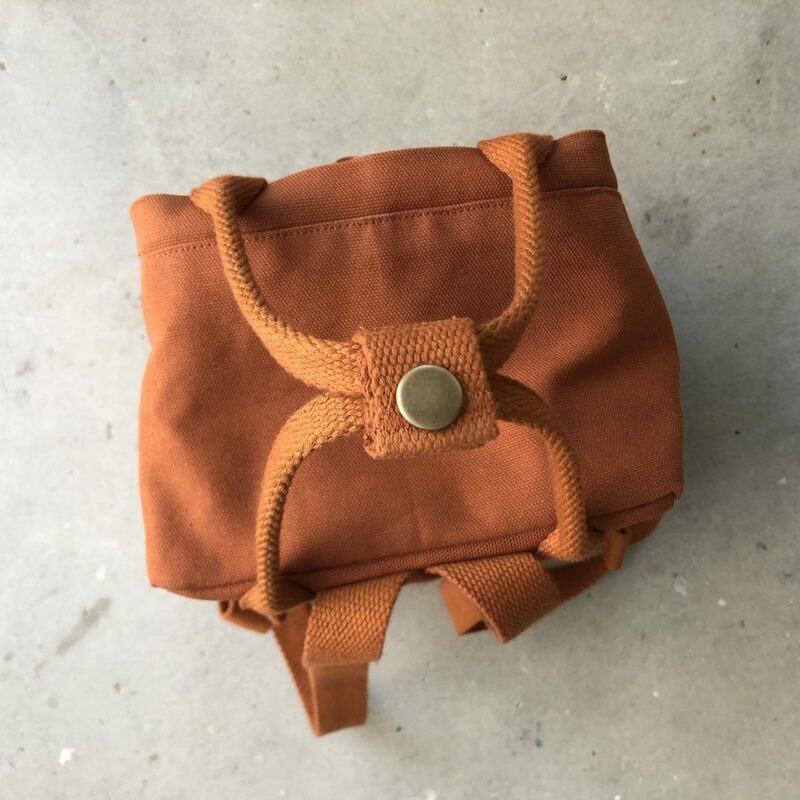 After much deliberation, I went with the Brush Brown canvas for the front pocket, Dark Brown canvas for the exterior (which reads as a warm black to my eyes), black leather, and brass hardware. There are so many colors to choose from – it took me a while to settle on a color combination! Sewing and installing the hardware only took a couple of hours, thanks to the Maker Kit. 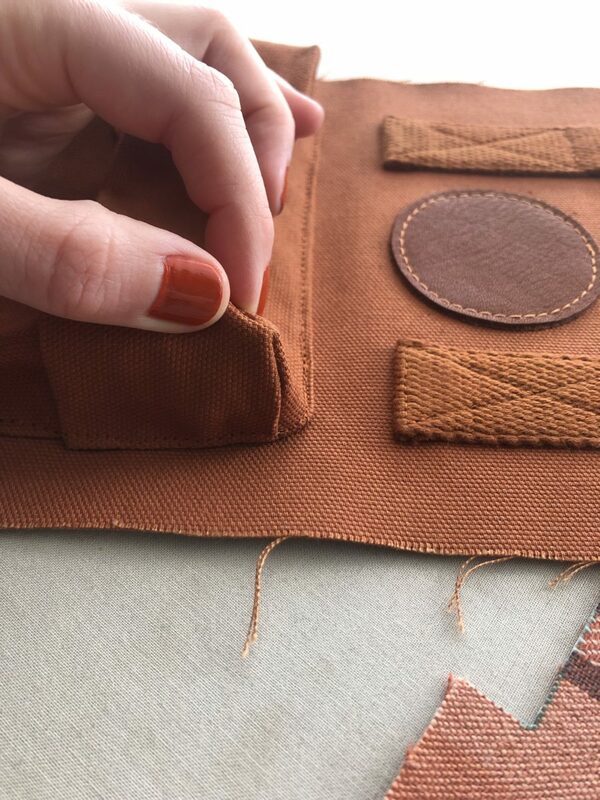 Maker Kits include pre-cut and marked fabric, making the process super fast. 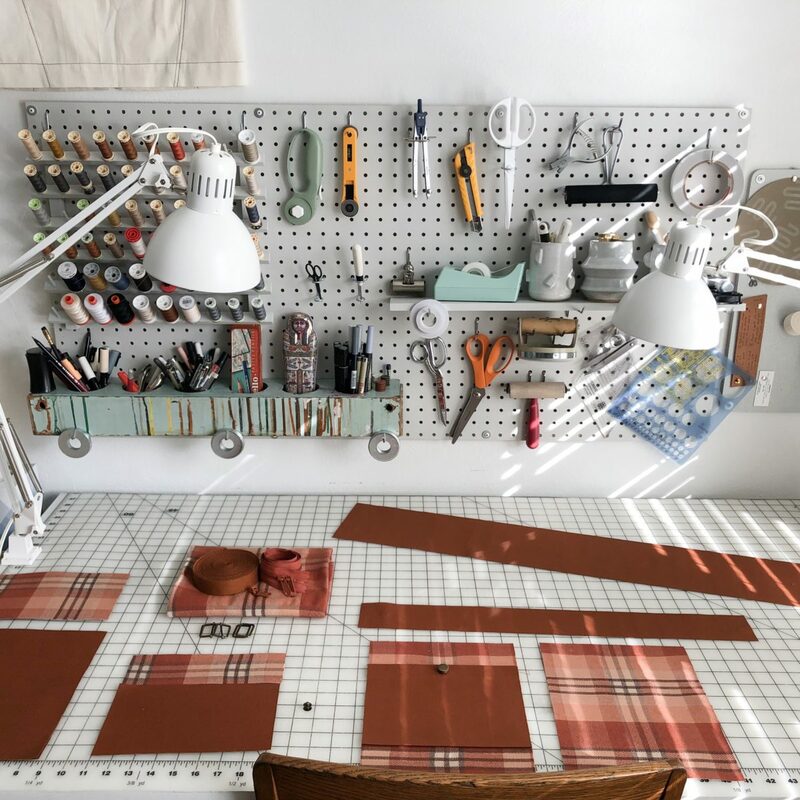 Klum House also has Finishing Kits, which include the leather and hardware – you just supply the fabric, or for ultimate customization options, you can buy just the pattern. 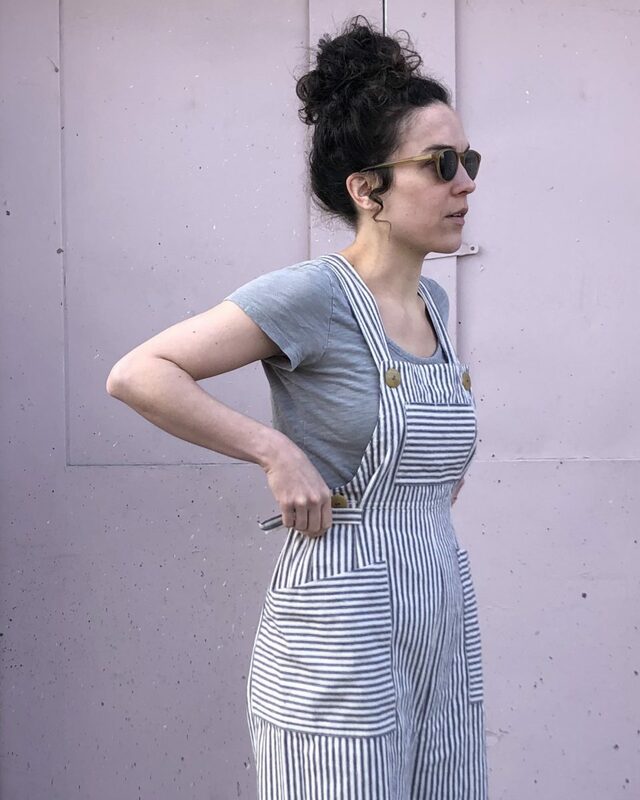 I will say that Ellie’s video tutorial (access included with pattern purchase) make rivet setting look like it takes just a few light taps, but I found I really needed to put some weight into it and hammer on the concrete of my porch. The tubular rivets, which are new for the relaunch, are really, really durable. The Finishing and Maker Kits also come with all the tools you need! 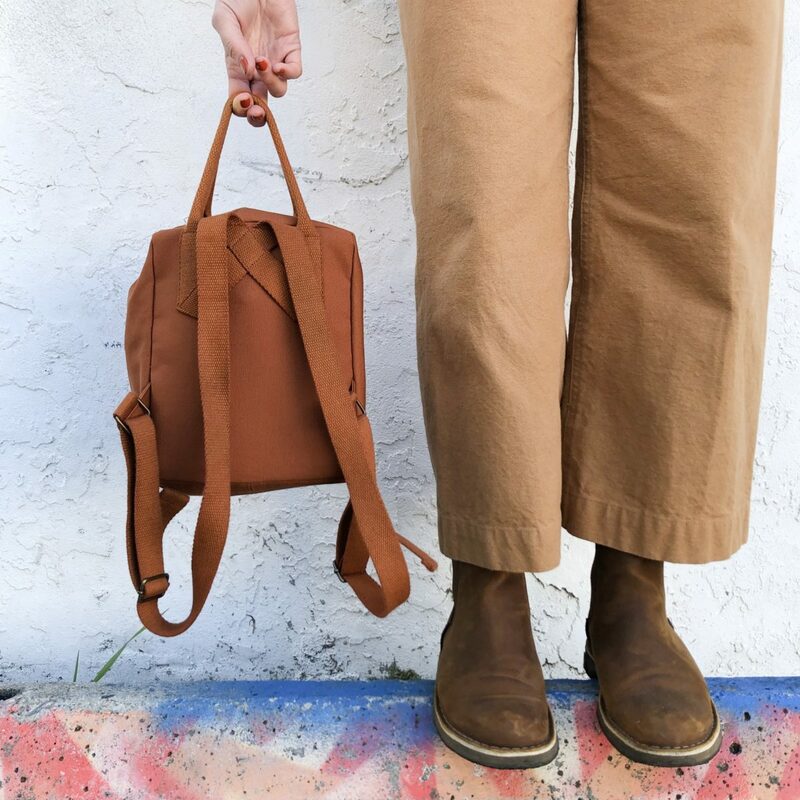 The Maywood is a really good size for a day bag. I have been able to carry my 15″ laptop, a sketchbook, a small bag of art supplies, and my usual purse things (wallet, lotion, keys, etc.) comfortably and with some room to spare. 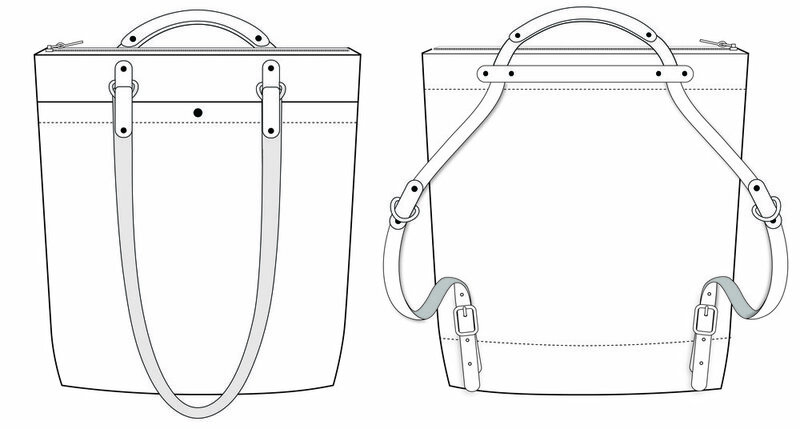 The front pocket provides additional toting space even with the front strap tucked inside. I’ve made many a boxed corner, but the construction technique used in this pattern is super smart. It pretty much guarantees your seams will match up! 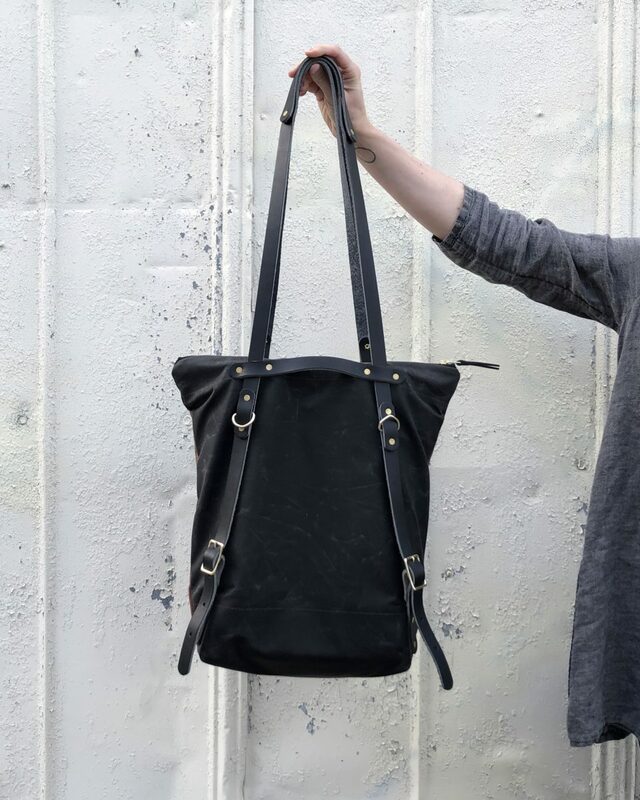 Here’s the coolest part of this bag – its versatility. Prefer to carry the day’s load at your side, it does that. Want to carry your stuff on your back, no problem. 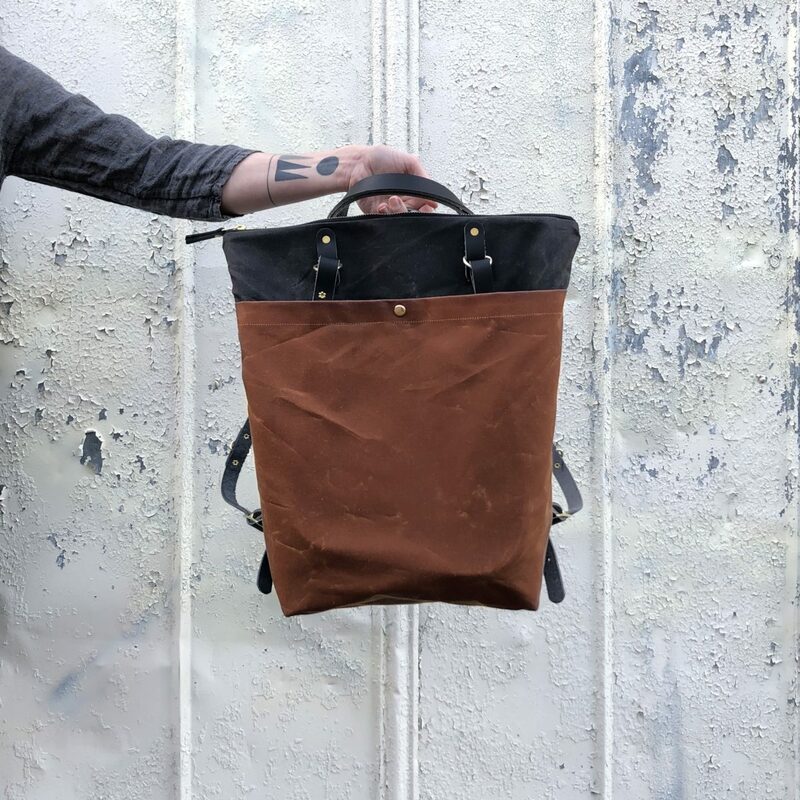 With a simple tuck and pull, the Maywood converts from a tote into a backpack. So clever! 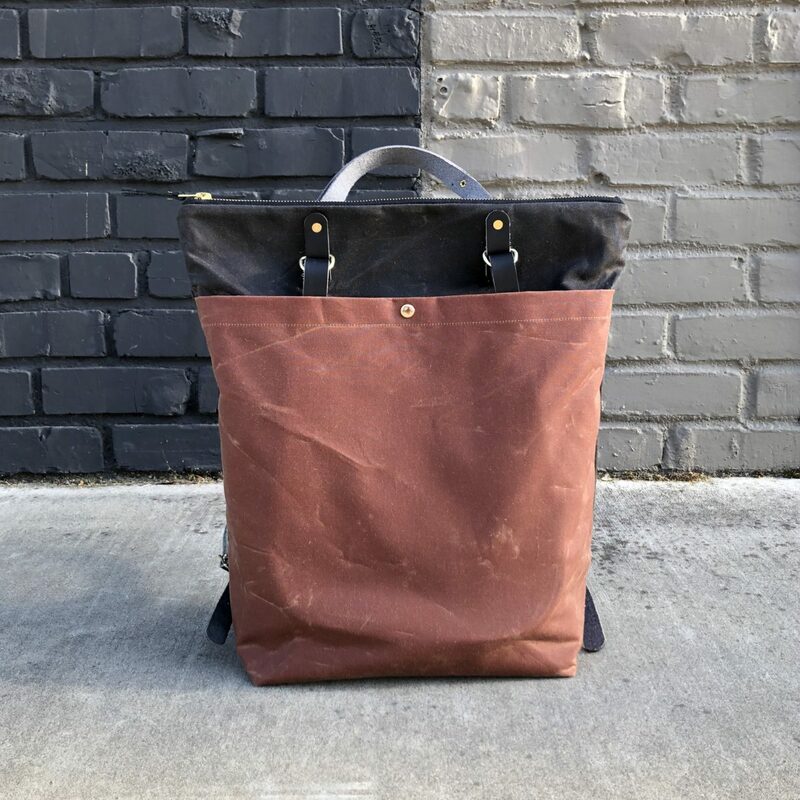 I’m very happy with this make and am contemplating making a matching Fremont Tote for a slick travel set. 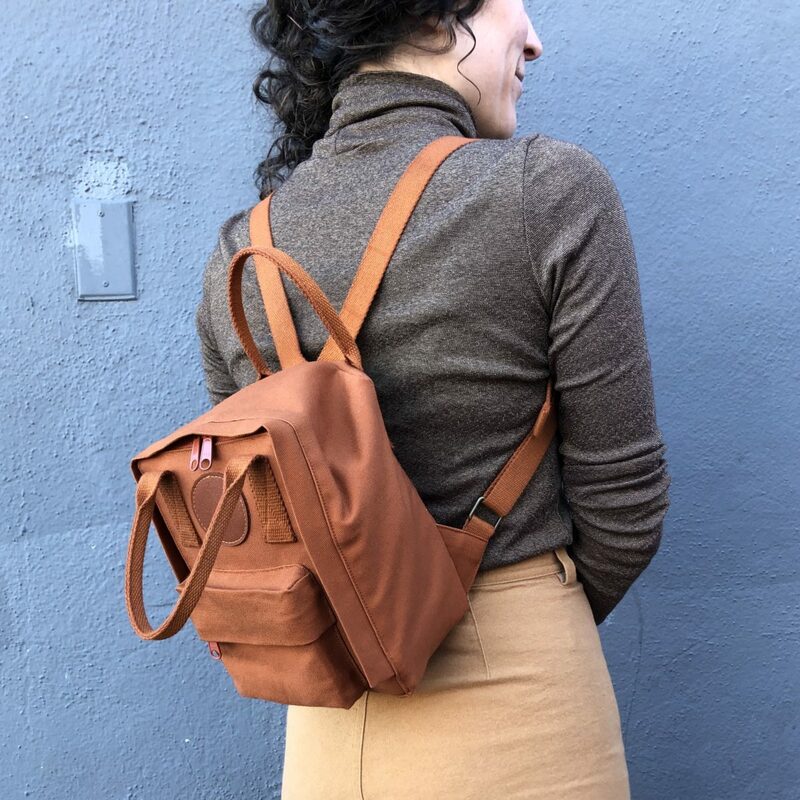 Remember there’s a discount code that’s good until April 22, if you want to make the Maywood too! The discount code MAKEMAYWOOD will take 10% off the purchase of any Maywood products. Disclosure: I received the Maywood Maker Kit for free but all thoughts and opinions are my own. If you use the above link to purchase a Maywood product, I will receive a small commission from the sale with no change in cost to you. 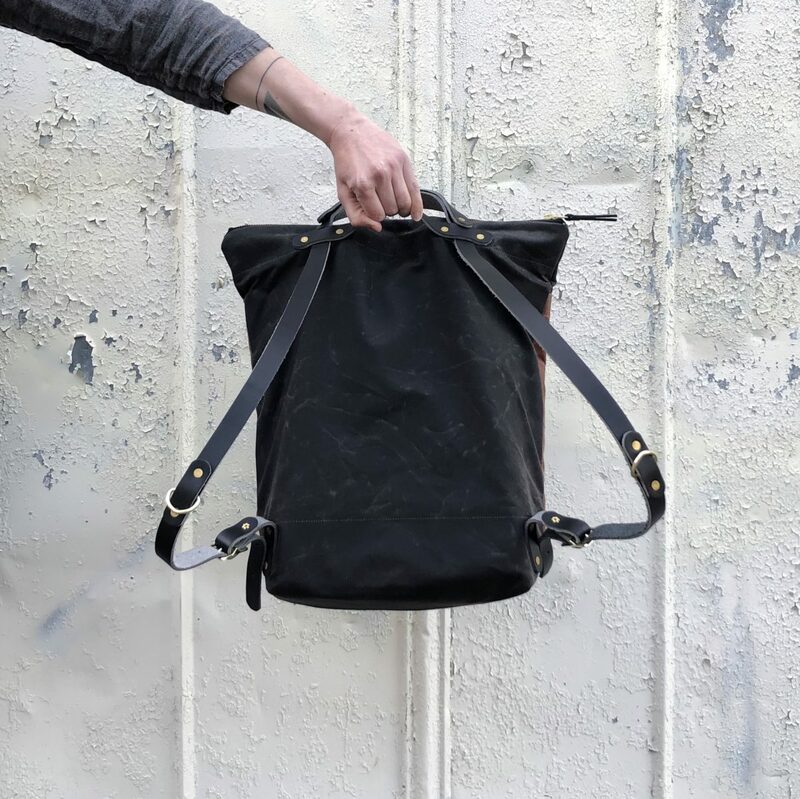 The revamped Maywood Totepack has arrived! 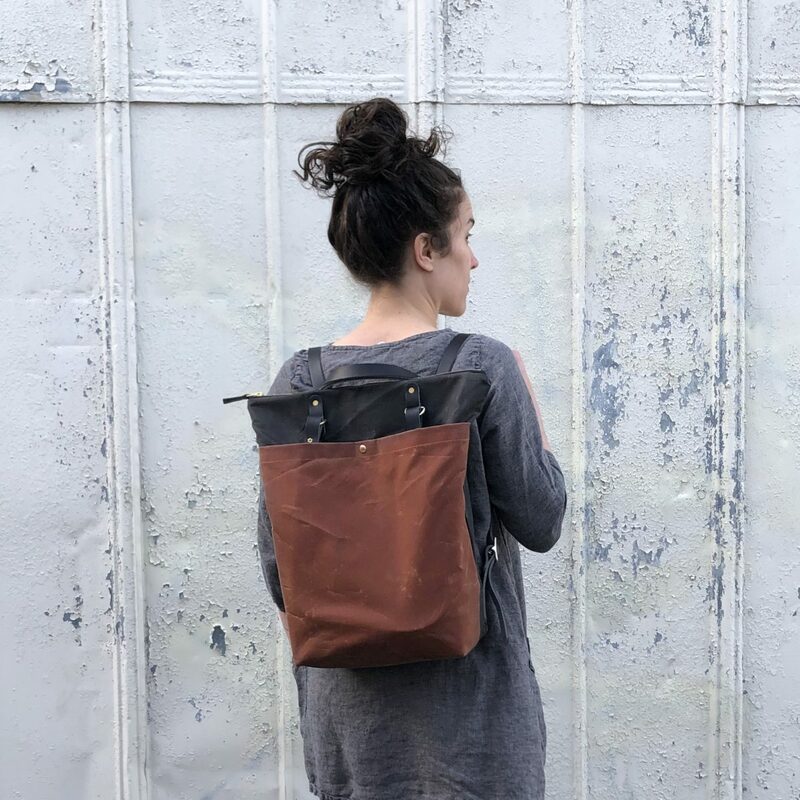 The Maywood is basically two bags in one; it transforms from a tote to a backpack with a simple slide and tuck and I CANNOT WAIT TO MAKE IT. 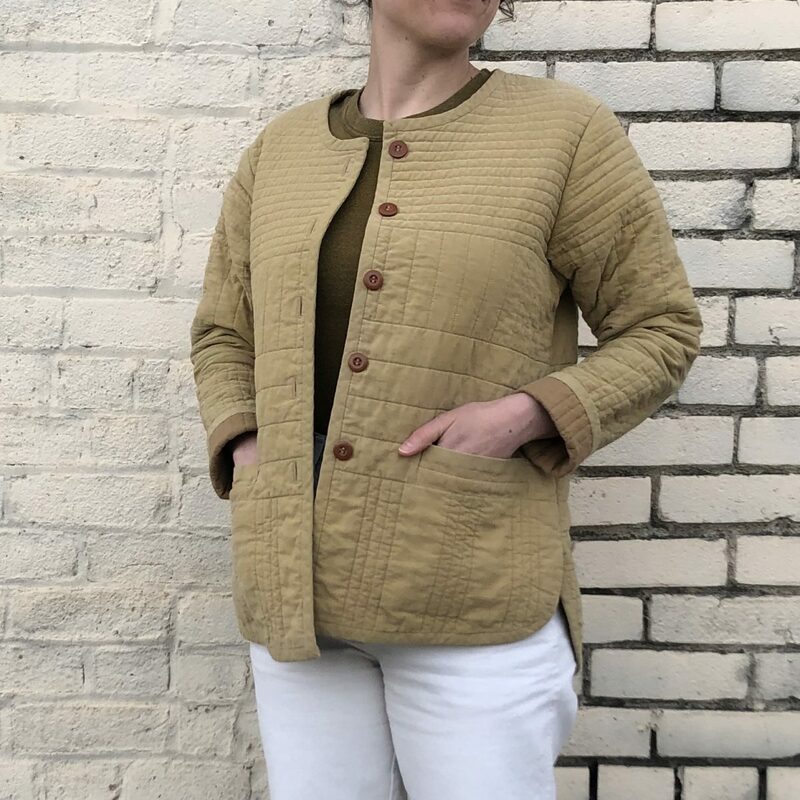 Ellie over at Klum House is a gem and has asked me to test out the updated pattern / hardware and share the process with you all. Best part? She’s included a sweet discount code for you! 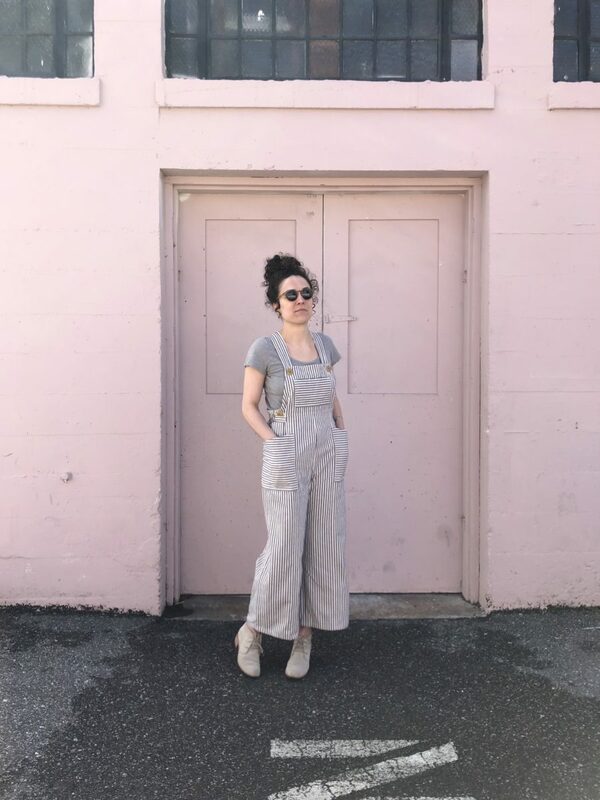 Click here to shop Maywood! The discount code is MAKEMAYWOOD. It will take 10% off the purchase of any Maywood products between now and Monday, April 22 at midnight. 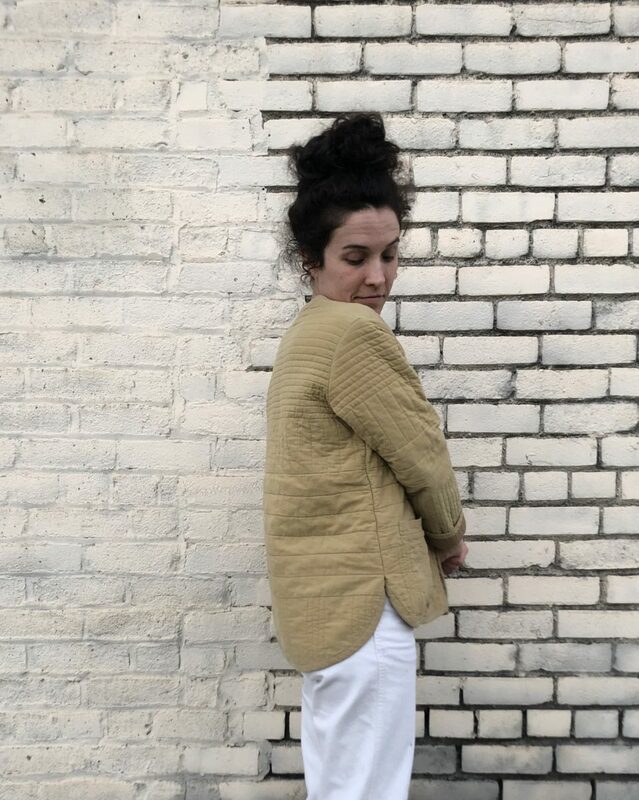 April 22 is the shipping deadline for anyone who wants to participate in Klum House’s Live Virtual Maywood Class on Sunday, April 28. 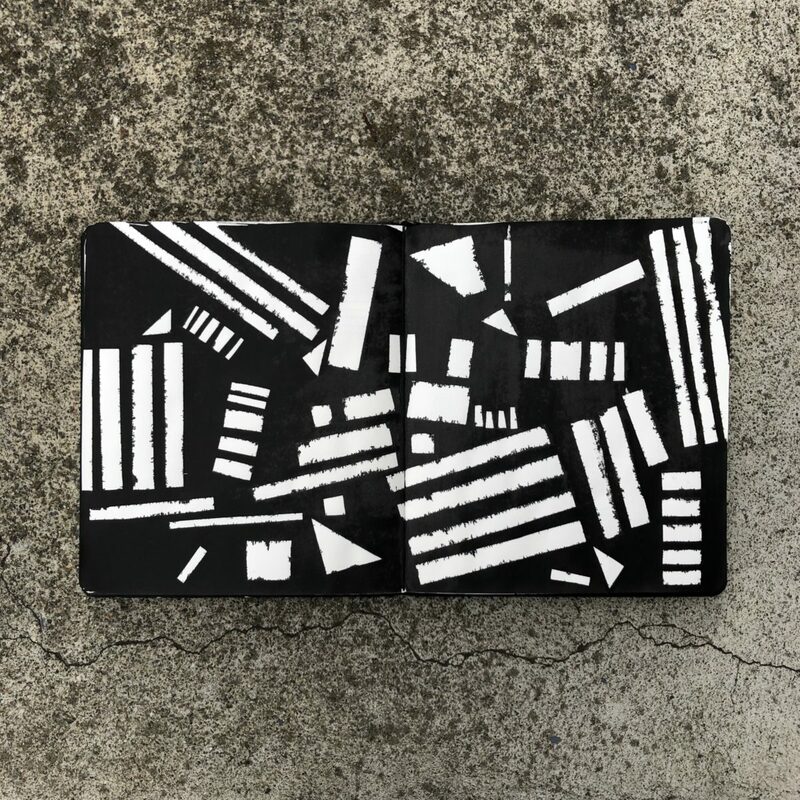 Access to that live class is free for anyone who buys a full Maywood Maker Kit (and $10-30 sliding scale without the maker kit). 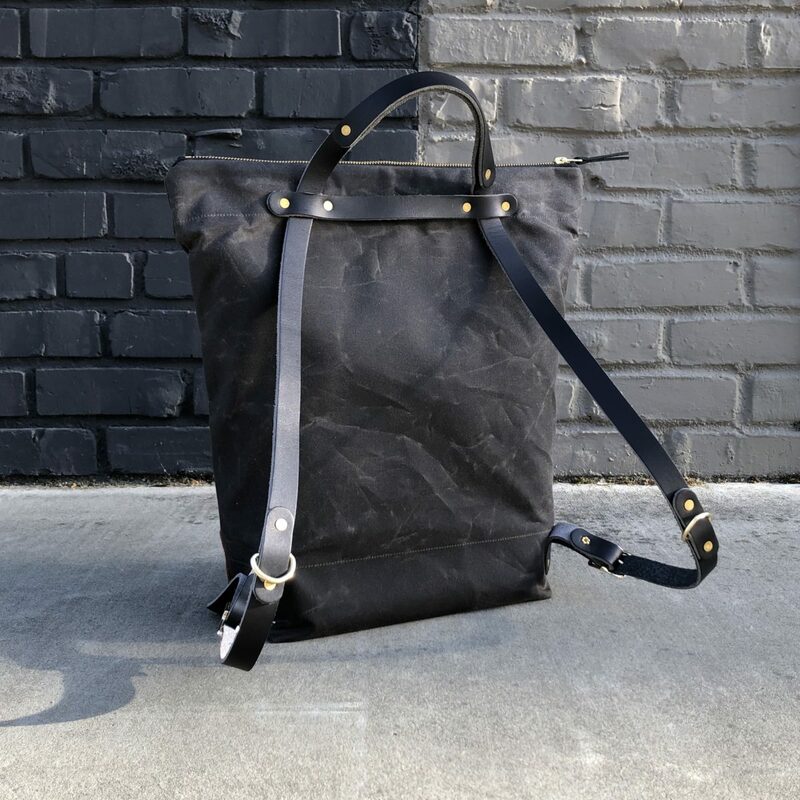 Klum House patterns are super approachable and result in really fabulous, high quality bags. 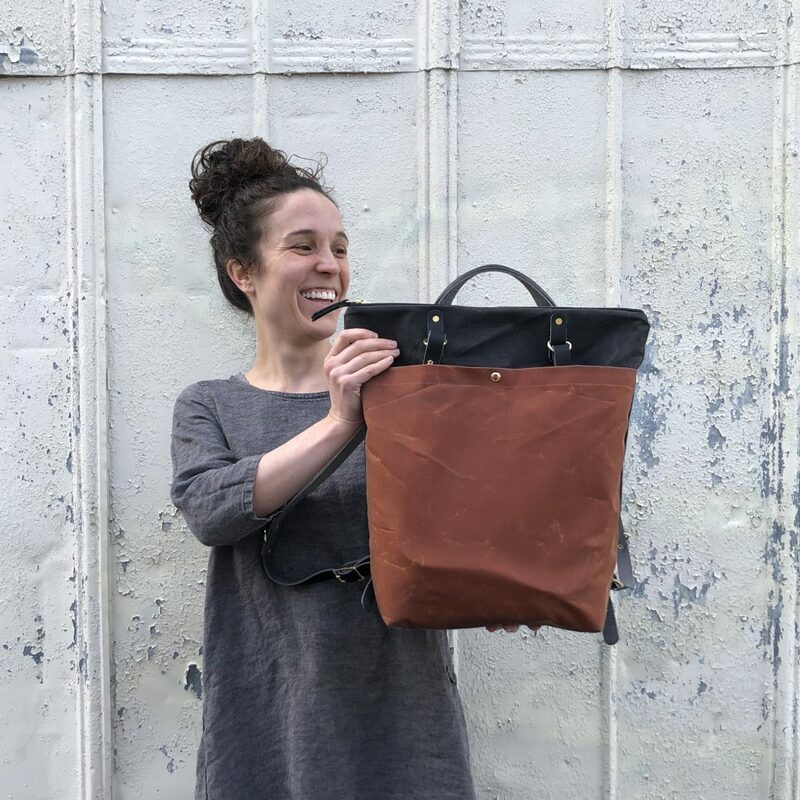 Make the Maywood with me – I’ll be sharing my progress on Instagram and my finished bag on the blog April 17th! Yesterday morning, I was fondling fabric in my stash and inspiration hit. It hit so hard, I couldn’t do anything else until I worked through it. The idea was pretty basic, but was engrossing enough that I forgot to eat or brush my teeth until 2pm. Gross, or awesome – I can’t decide. It’s a pretty simple hack. I cropped and straightened the original curved hem, then just drew lines until I had a tie shape I liked. I made sure to square off from center front and the side seam for about a 1/4 inch before swooping down. I made the XS size and cropped it by about 3 inches. The tie length ended up being around 13-ish inches, I think. 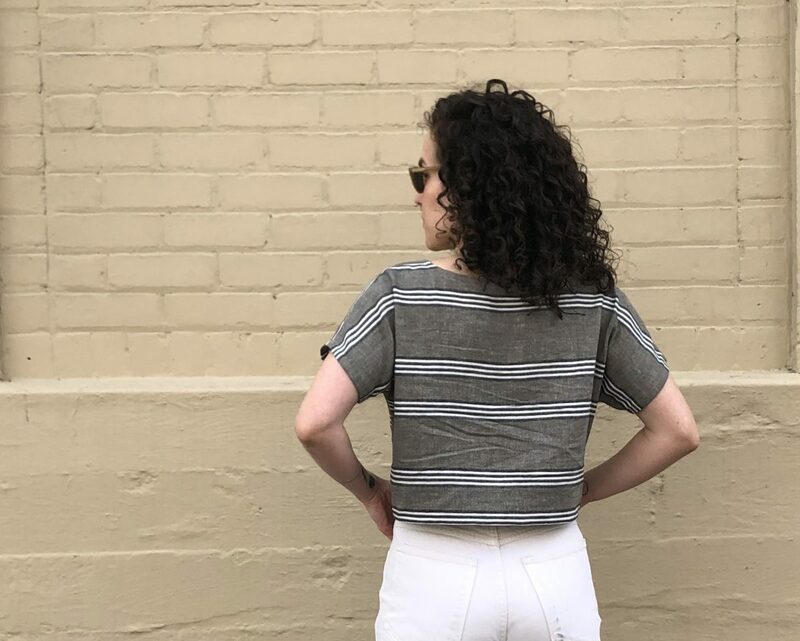 I managed to cut the back piece so that the stripes don’t match up, but I’m going to blame that on the small amount of yardage I had… it totally wasn’t because of that. GAH! Initially I wanted a snugger fit around the waist, but I actually like how it hangs away from my body. I didn’t want to fuss with a tiny hem on the ties and decided to use a hem facing. To do that, I traced the bottom portion of the shirt front and back pattern pieces. The facing comes up about 3 inches from the bottom hem and ties (see last picture). I assembled the shirt as instructed, but used faux-french seams for the sides. To finish the hem and ties, I sewed the front and back pieces of the hem facing together and pressed the seams open. I then pressed the top edge a 1/2 inch down toward the wrong side and pinned the facing to the shirt right sides together. I sewed around the bottom edge using a 1/4 inch seam allowance, clipped the corners of the ties, and turned everything right sides out. I gave it a good press, then edgestitched the hem and the top of the facing to the shirt. I had to use another fabric for the hem facing and bias neckline finish, but I kind of love the contrast. 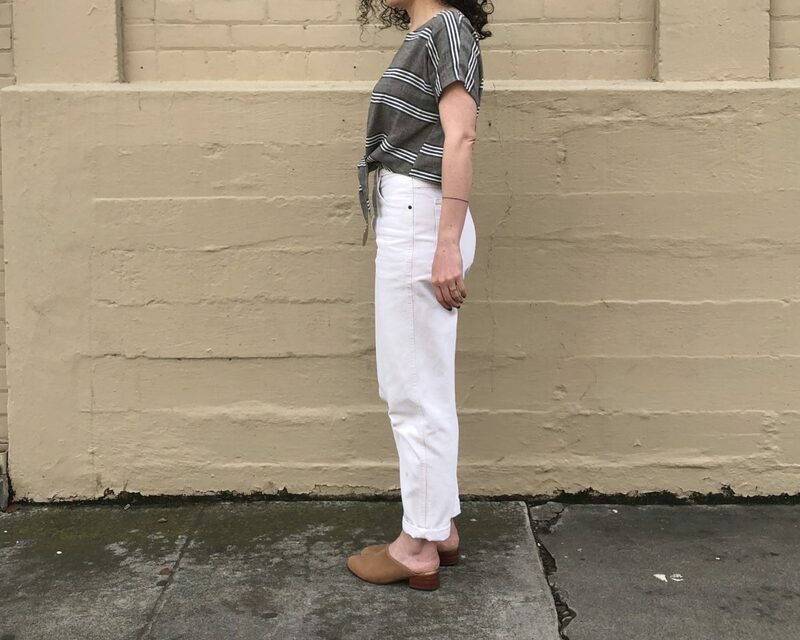 It’s leftover fabric from this Maya Top, which is a little heftier than the main fabric. 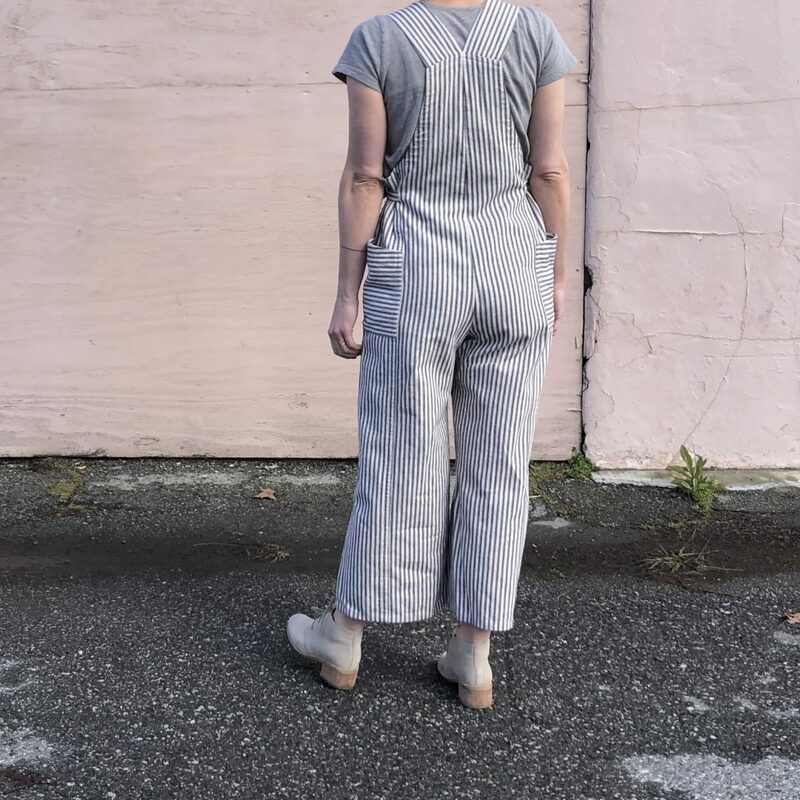 It adds some structure to this squishy cotton-linen blend from Stonemountain. I think it also helps the ties not stretch out of shape. And it’s a thrifted tablecloth! 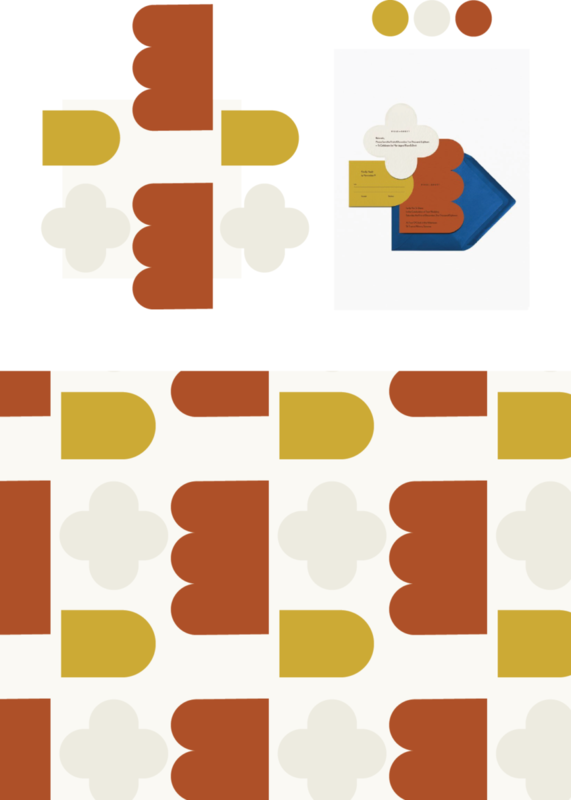 This pattern is great right out of the envelope (see here and here), but is also such a fun base to hack. 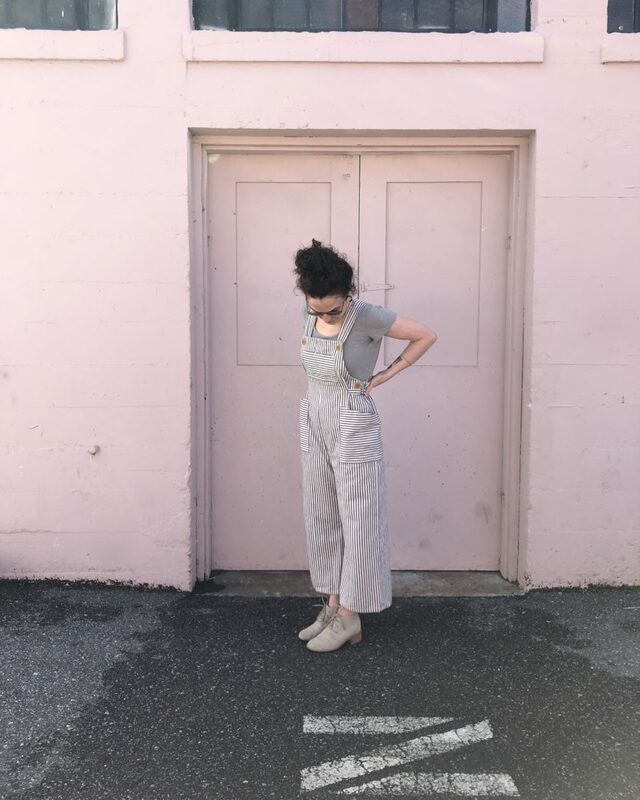 I’ve turned it into a dress, an Ace & Jig-esque top, and now this fun top! 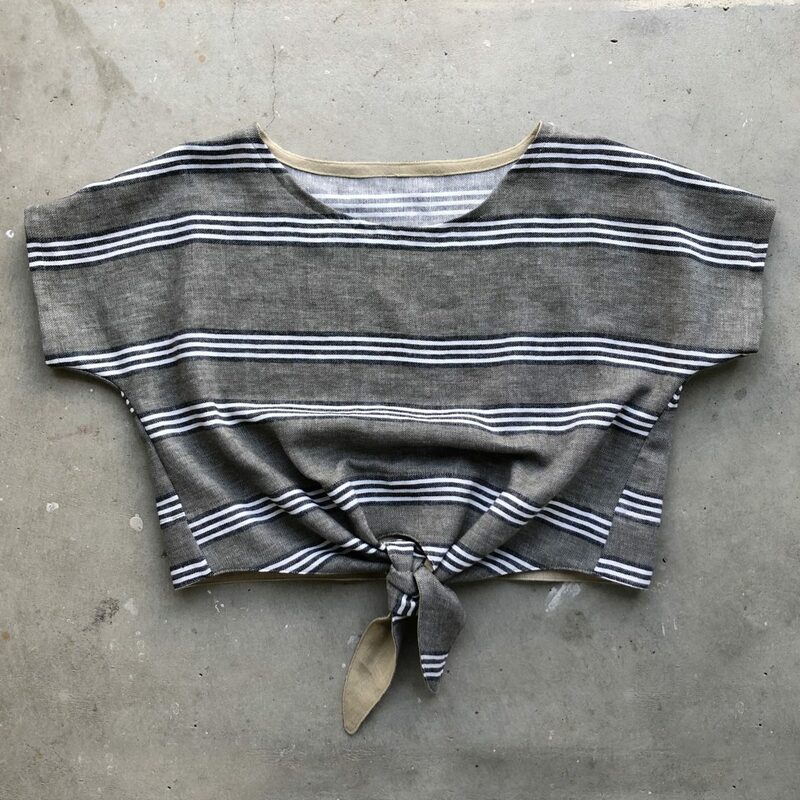 I have a feeling this will get a lot of wear this summer, but let’s be honest – I’m going to wear it under sweaters until it warms up. Have you made a Shirt No. 1 yet? As I’ve mentioned before, I freaking love sewing bags. 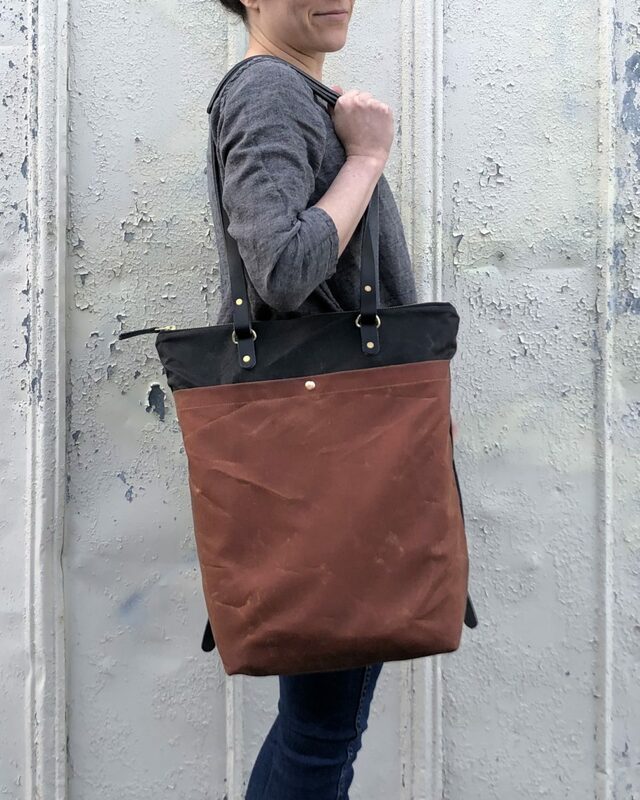 They are super satisfying to make and when I tell folks I’ve made the bag they’re admiring it feels SO GOOD. 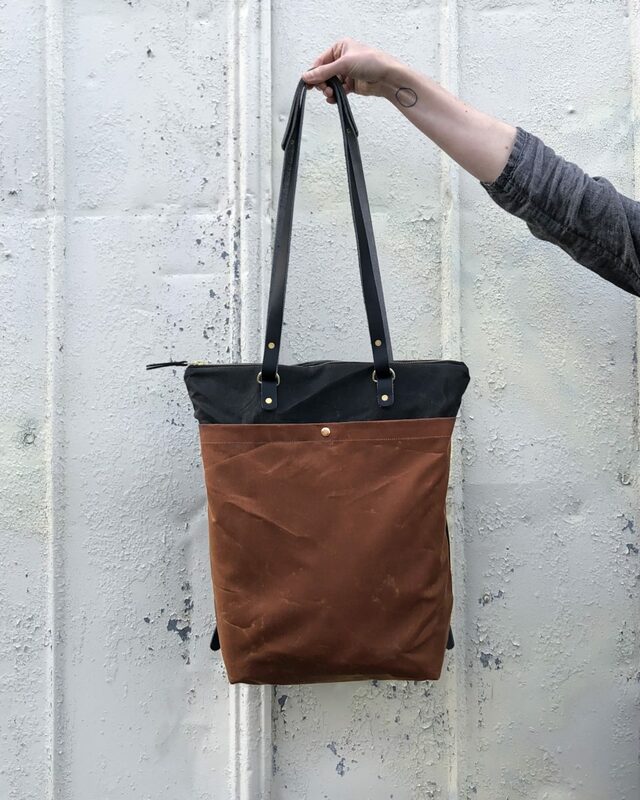 Really though, if you haven’t tried making a bag yet, you should! 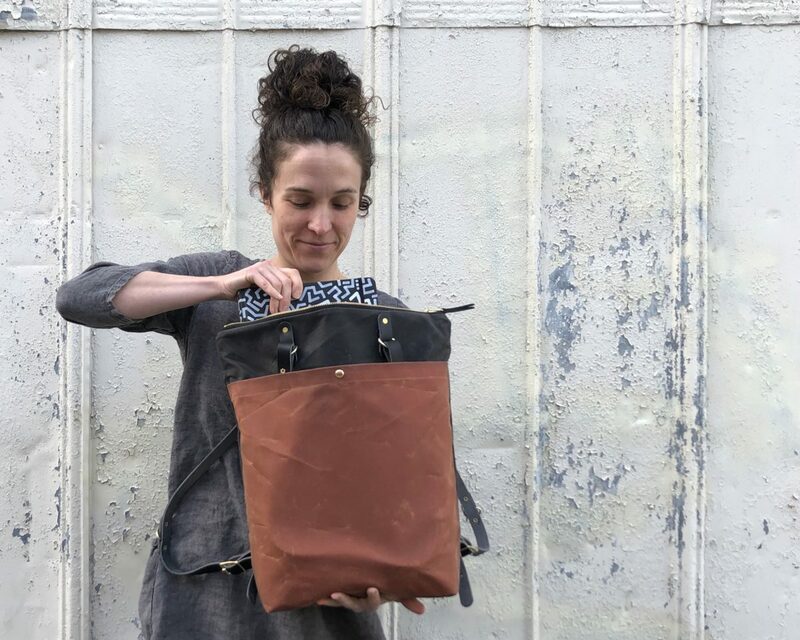 My favorite bag patterns are from Noodlehead, Klum House, Purl Soho, and now Sarah Kirsten. 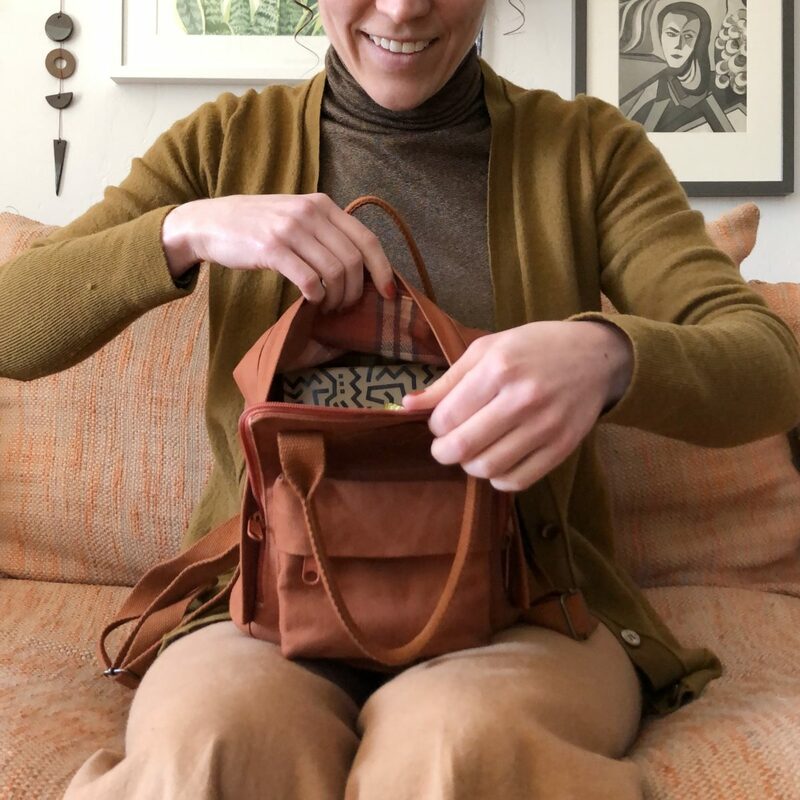 In late January when Sarah Kirsten put out a call for testers for her new pattern, the Raspberry Rucksack, I filled out the survey as fast as humanly possible. 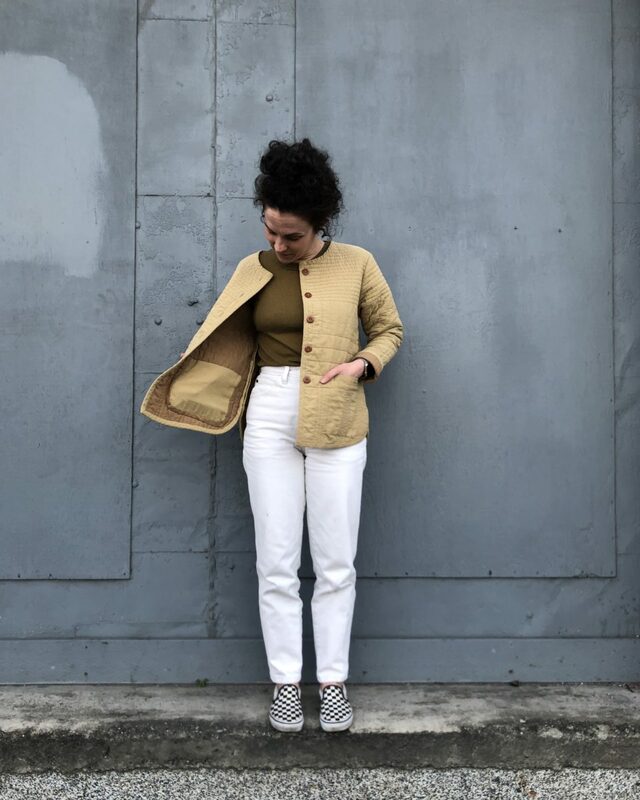 The pictures she posted looked similar to the iconic 1970’s Fjällräven Kånken that I’ve secretly lusted after for years and was super excited to find a sewing pattern to meet that want. 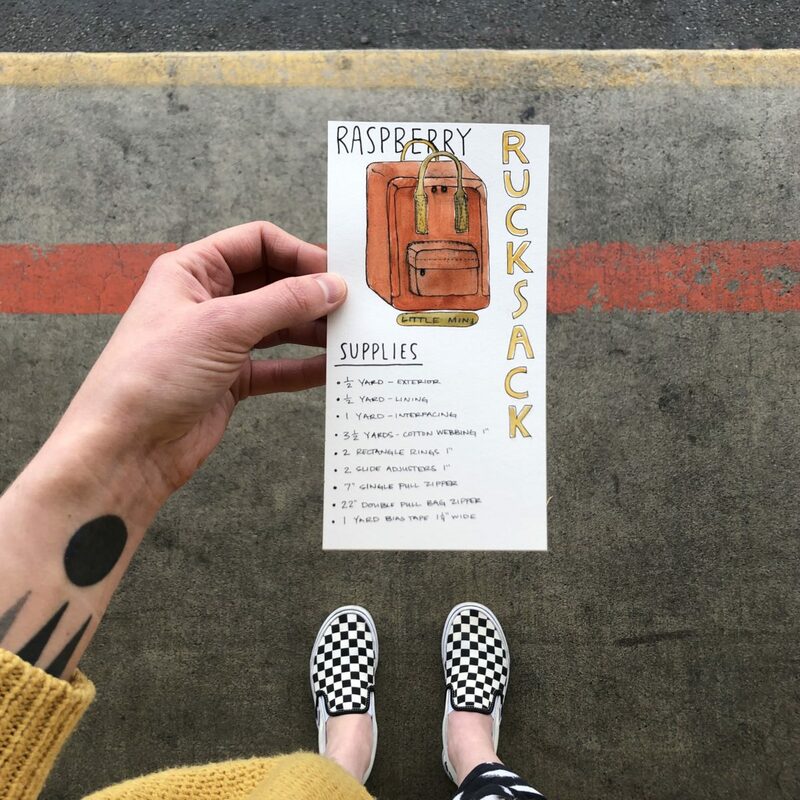 The Raspberry Rucksack is fully lined (unlike the Kånken), comes in two sizes, is completely customizable, and best of all – is sewn by you (or a really dedicated loved one)! 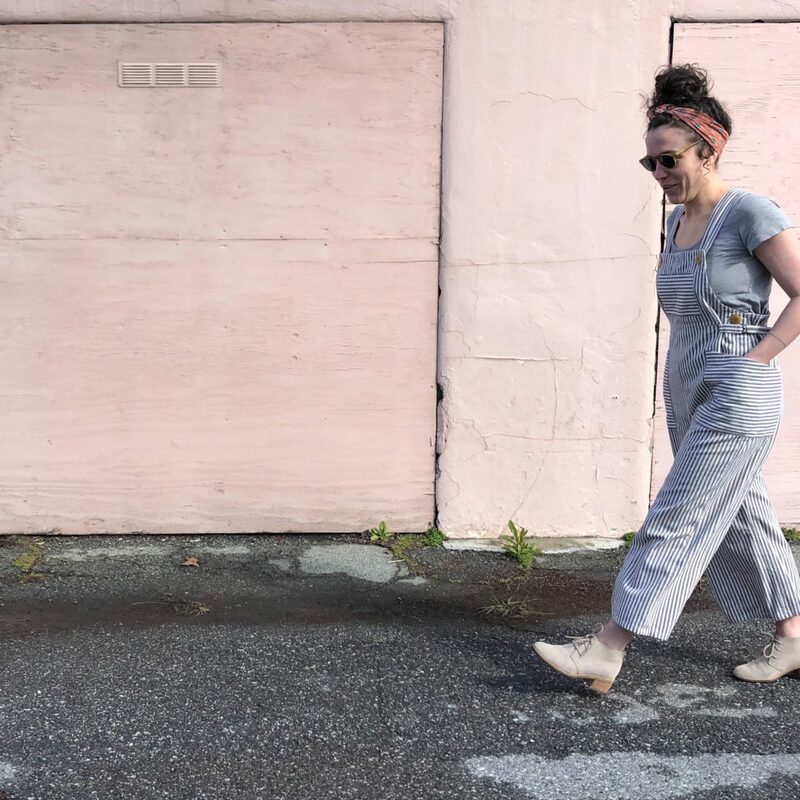 I think one of the best things about sewing is that you can take RTW things that might otherwise not fit your body or fully suit your aesthetic and customize them to your liking. 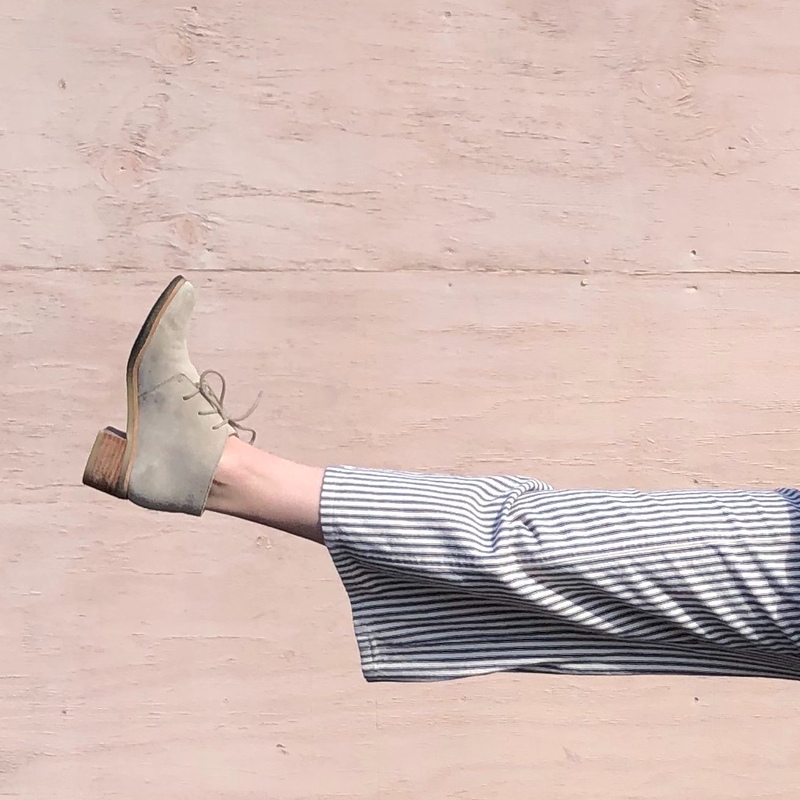 For me, it’s far more appealing to make the things I wear and use rather than buying them. I was so delighted to be chosen to test the pattern and immediately started planning. 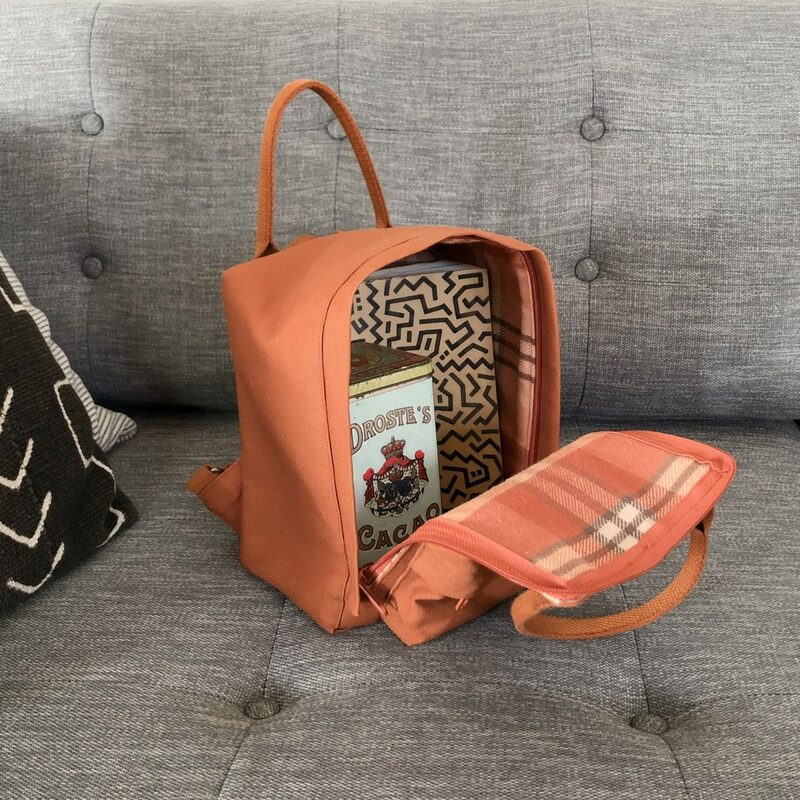 I chose the Little Mini size since I have enough big backpacks and I thought the Little would be perfect for toting around my logbook and art supplies, or as a purse. 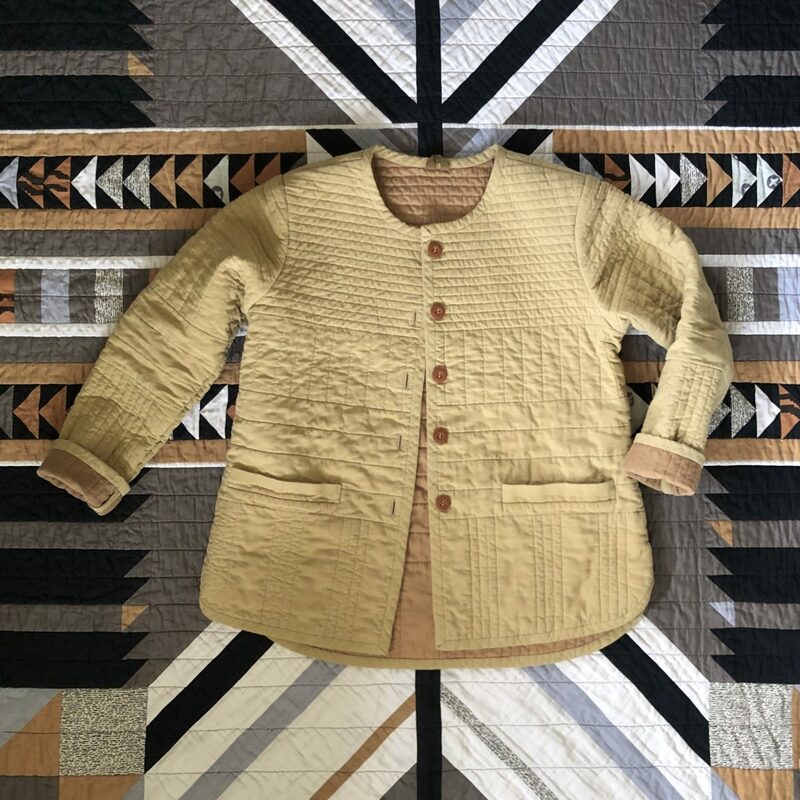 The pattern calls for heavyweight canvas for the exterior and quilting cotton for the lining. I’m really having a moment with rusty reds and oranges and quickly settled on this Big Sur Canvas from Stonemountain. 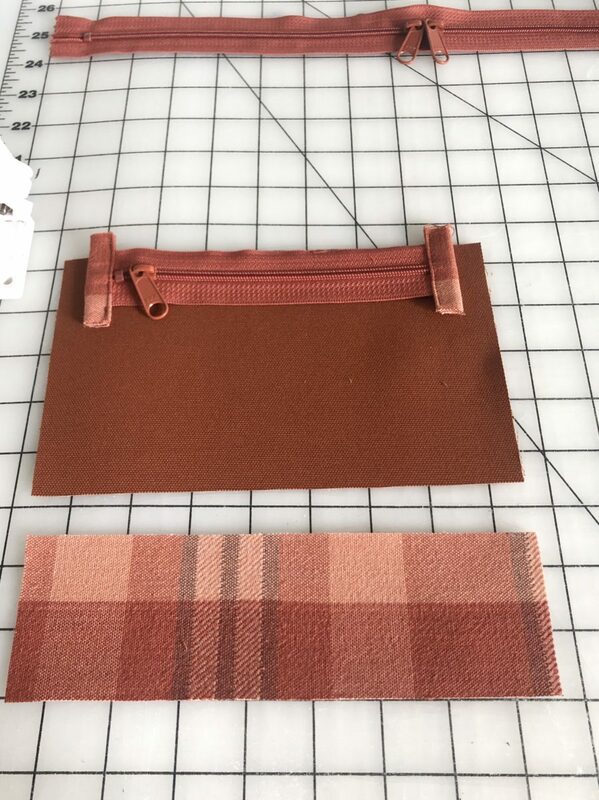 I wanted the zippers to match the exterior fabric and after a little internet searching, bought one 30″ double-slide zipper (color Redwood) and one individual zipper pull from Zippers By Annie. 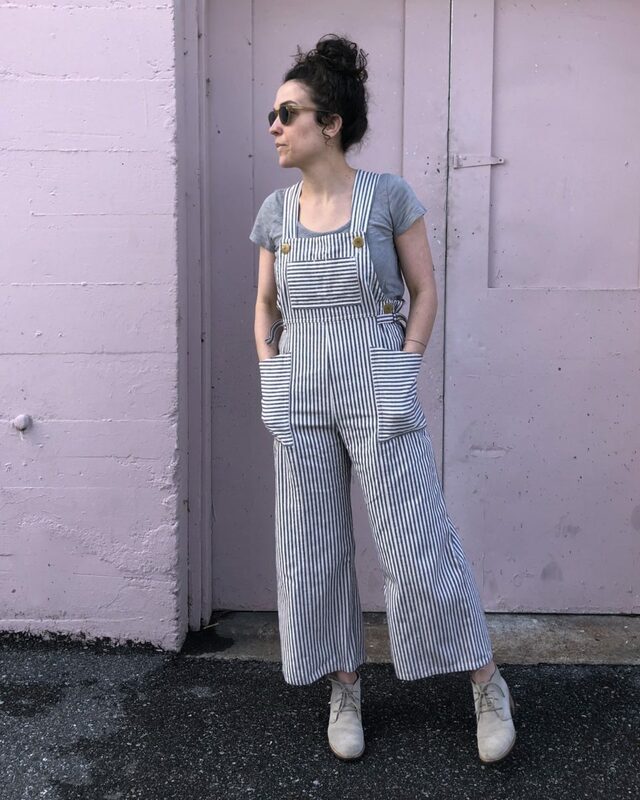 They offer a wide variety of colors and stated the zippers could easily be cut and another pull installed on the remaining length. I really like when the hardware on a project matches! 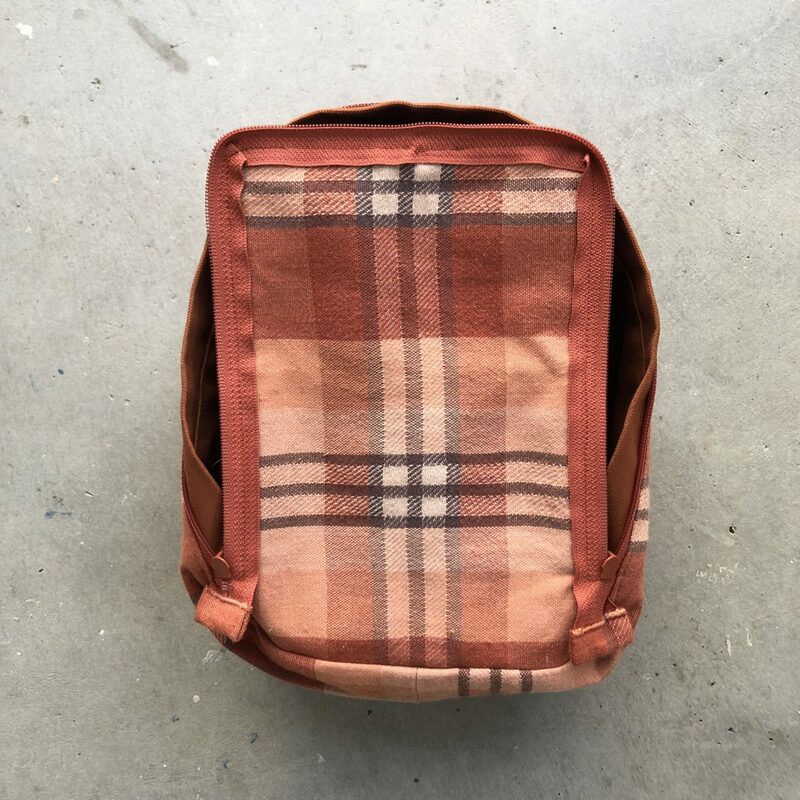 I was planning to use leftover fabric from my Making Backpack for the lining, but then found a plaid tablecloth at a thrift store – it was a perfect color match! I also bought webbing, rectangle rings, and slide adjusters from Stonemountain. 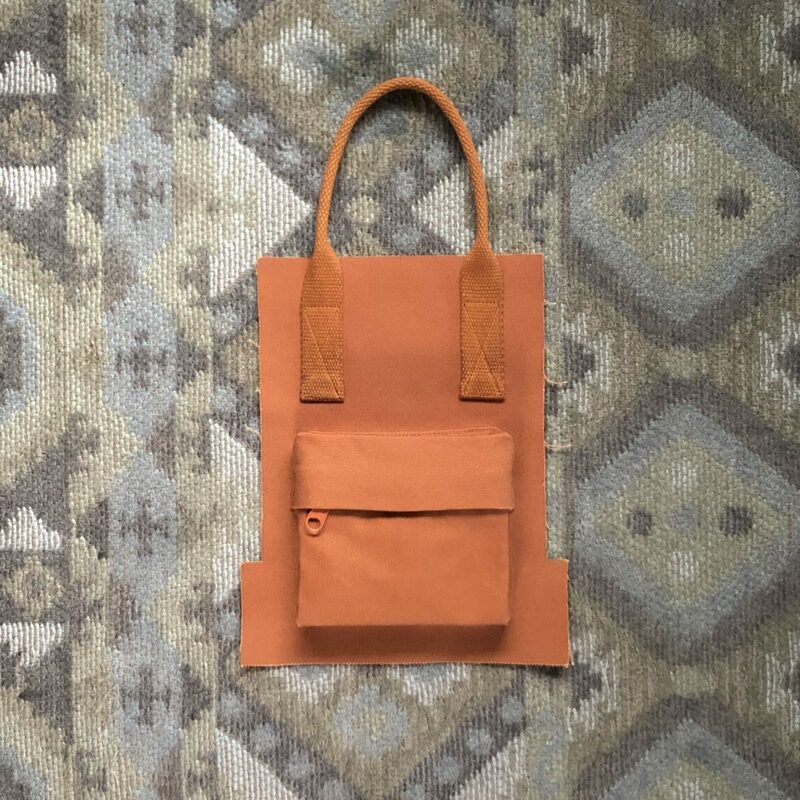 I was ready to start sewing, but after placing the golden yellow webbing on the Canyon Brown canvas it was clear I needed to adjust my plans. I did not like the contrast and decided to dye the webbing since a match couldn’t be found in stores (I searched EVERYWHERE). Dying proved to be a little challenging, but after de-tangling the webbing from the washing machine agitator (don’t dye webbing in the washing machine! ), washing off some grease spots (seriously don’t do it! ), and a second round of dye, I achieved the desired color. Totally worth it! After sewing on the popup pocket and front handle, I thought I’d further mimic the Kånken by adding a circular patch. I dug into my scrap leather pile and found a really lovely piece, but because it was super thick, my cutting was a little too sloppy and I questioned whether my machine could handle it. I bought a thinner leather piece and set out to attach it. After doing a pretty terrible job of sewing the leather patch onto my Making Backpack, I decided this time to use topstitching thread, my Bernina #10 edgestitch foot, and a stitch length of 4.2. It turned out pretty perfect, but I wasn’t using a leather needle and my machine couldn’t handle backstitching, so I had to figure out a way to secure the stitches. I cut the threads long, and with a hand sewing needle brought the threads to the backside and tied them off there. I kind of wish I had used topstitching thread for the webbing too! Attaching the popup pocket was definitely challenging. I found it next to impossible to pin it to the front piece and opted to hand baste it in place. For the webbing I used Wash Away Wonder Tape to stick everything in place, which I highly recommend! I hand basted the main compartment’s zipper in place too. 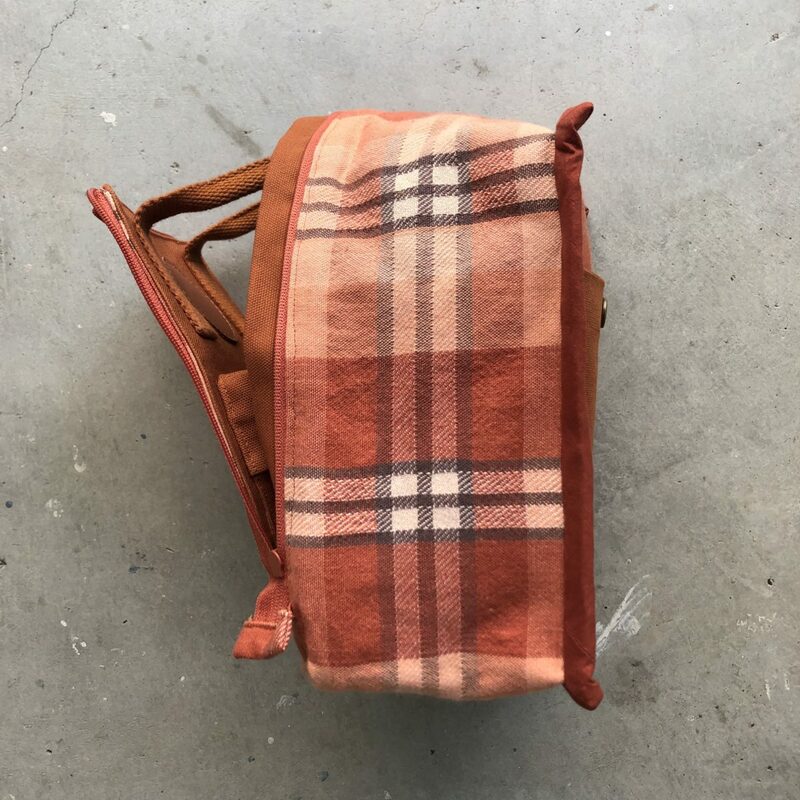 If I made this again, I would definitely be more aggressive with rounding the top corners – mine are a little too subtle, which causes the zipper pulls to occasionally get stuck. It also meant I had to add folds in the zipper tape to make it go around the tiny curves. 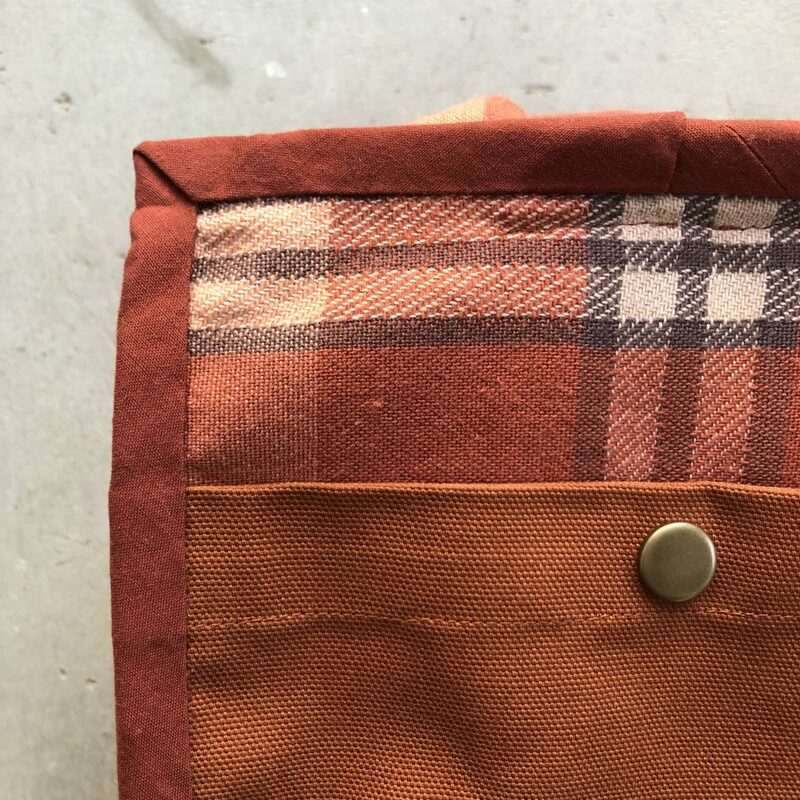 I tend to fuse all of my interfacing before getting started and because the thrifted table cloth was a little wiggly, I opted to fuse all of the interfacing to the lining pieces. BUT because all of the handles and straps are sewn to the exterior, the interfacing is needed there! DUH! I ended up having double the interfacing the pattern called for (except for the center panel), but I do like the added structure. If I make this again, I will most likely double up the interfacing on all of the pieces, maybe even including the center panel. After finishing the straps I had a couple lengths of extra webbing and decided to make this snappy-do to hold the handles together. It feels a little out of proportion to the rest of the bag, but I like how it keeps the front strap up when I’m wearing the backpack. 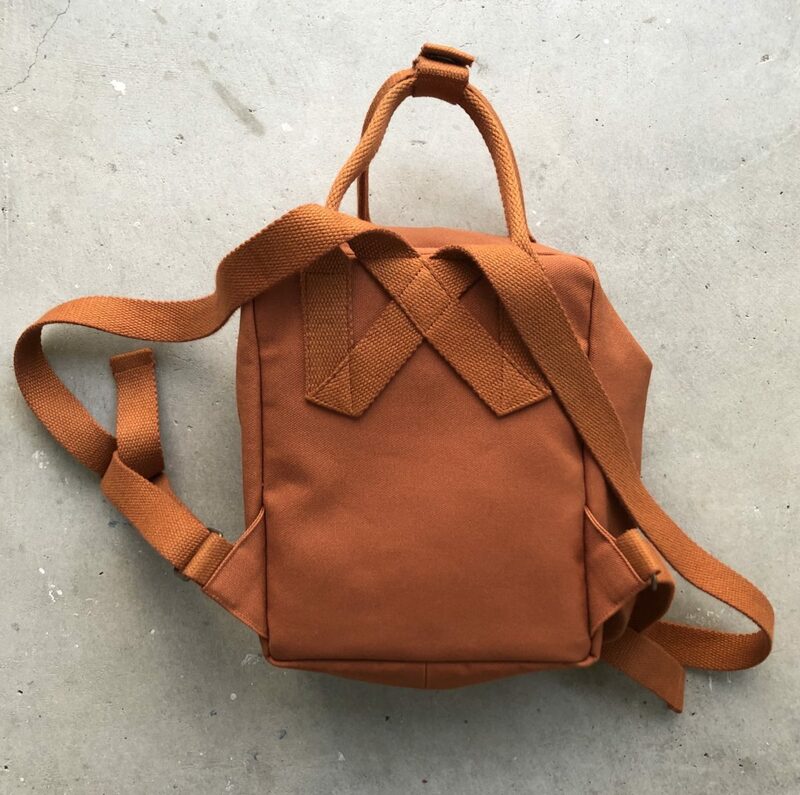 I went a little off script with the pattern and added the triangular side connectors using Noodlehead’s Range Backpack pattern pieces. The Rucksack pattern has the D rings attached at the bottom of the bag with a loop of webbing, which would probably work just fine, but I didn’t want to risk having to rip it all out like I did with my Making Backpack. 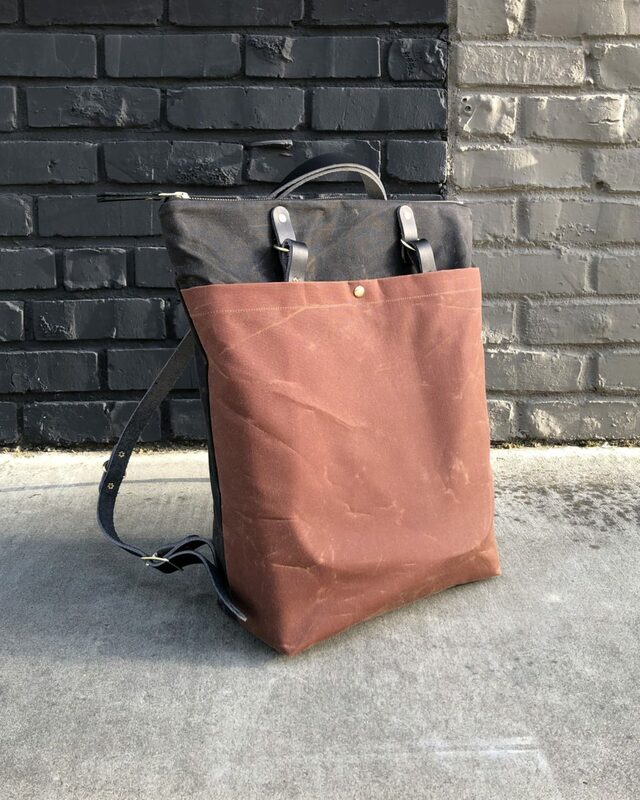 The construction of this bag is really incredible. Almost all of the seams are completely concealed! Total magic! 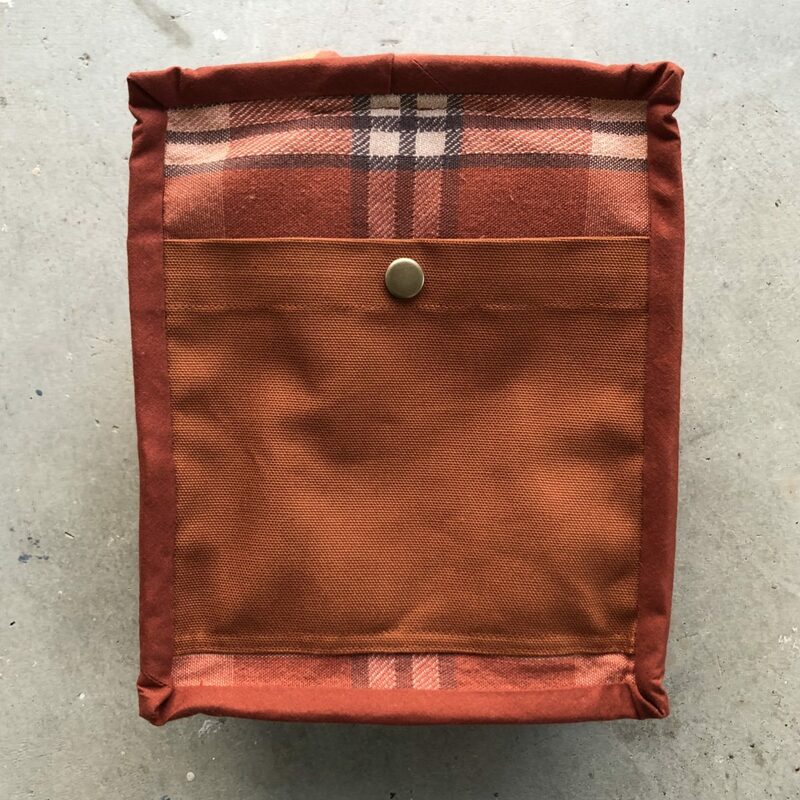 This front flap would have been a nice place to add a patch pocket / phone sleeve to the lining. The tester version of the pattern didn’t have a step to finish the ends of the main compartment’s zipper, but because mine had 7″ lobbed of its end, it was fraying like mad. 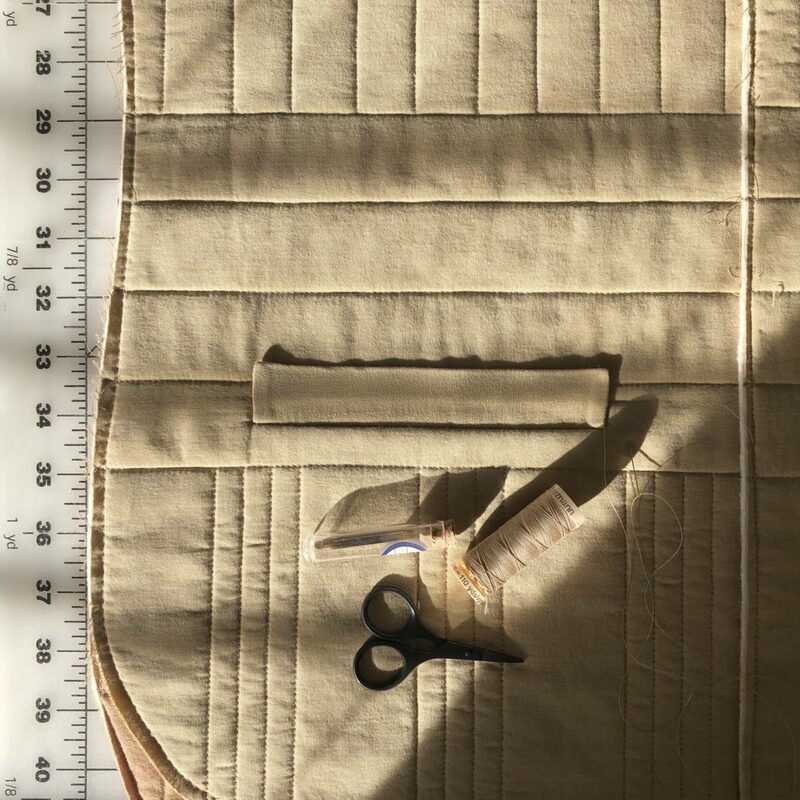 I finished both ends using extra lining fabric, but found I had to pull them out of the way of the seam when sewing the front to the center panel. They’re a little wonky, but I’m confident the zipper won’t fall apart now. Perhaps if you choose to cut your zipper down to size, you might want to consider using a different finishing method. The only seams you need to finish are at the back of the pack. 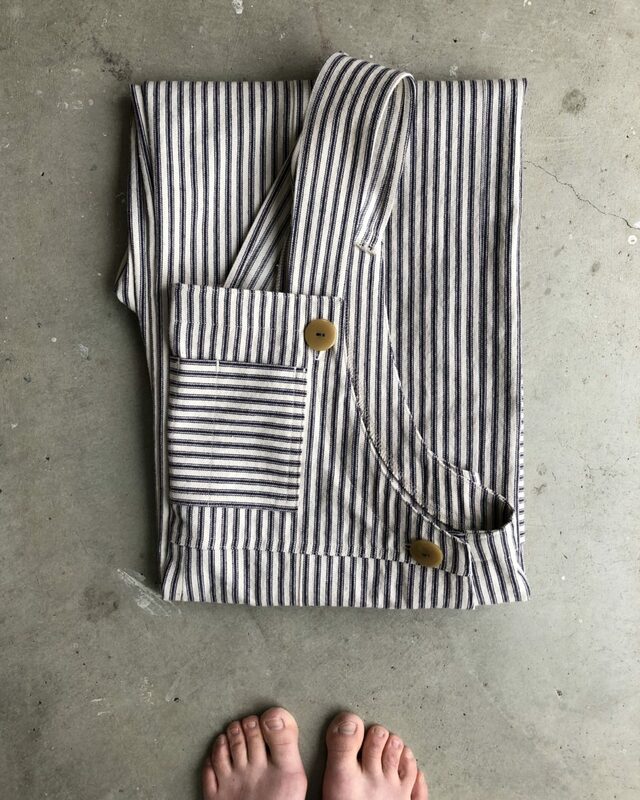 This pocket isn’t part of the pattern. Since I just guessed the measurements, it’s a little too tall to easily access way in the back of the pack, but since I’m using this as a purse, it’s nice to have a dedicated space for my wallet. I didn’t realize how overzealous I was with pounding in the snap until everything was already put together. 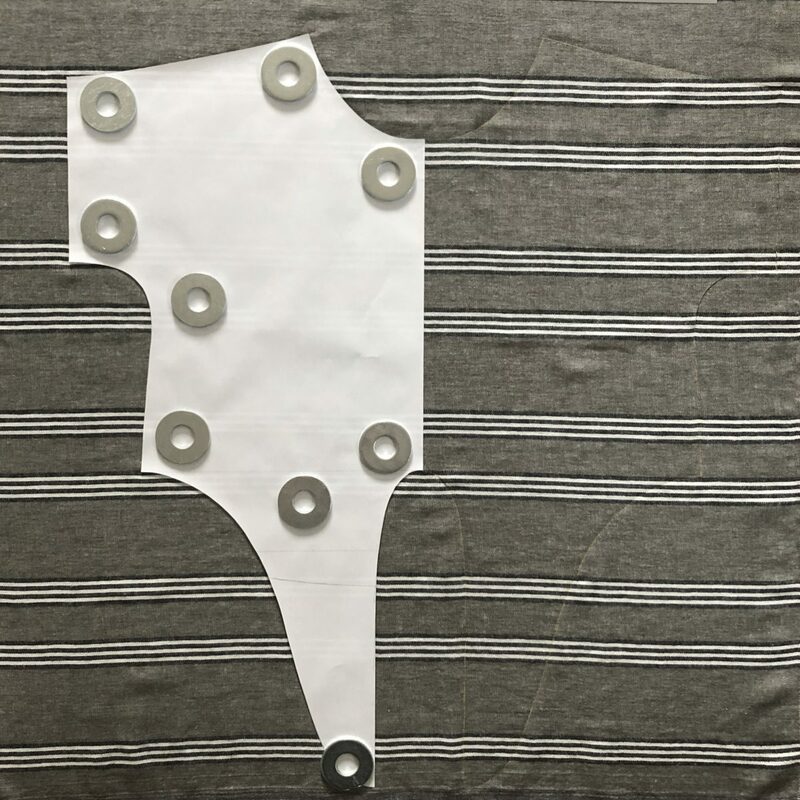 The part of the snap that is connected to the main back panel is rounded and might eventually rub a hole through the exterior fabric (really hoping that doesn’t happen)… it’s also frustratingly hard to unsnap. Oh well! I chose to blindstitch the bias tape to the bag. Even though you can’t really see it when the bag is right sides out, I think it looks really sharp. For the Little size there was one step I had to leave out because I couldn’t fit the bag neatly under my machine – the corners are just too tiny to get the clean edgestitching on the bottom that I’d be happy with. I hesitate to call this a good pattern for brand new sewists because it’s definitely a complex sew. However, I do think with some very small tszujes to the pattern’s instructions and a little determination from the maker, it’s totally doable. 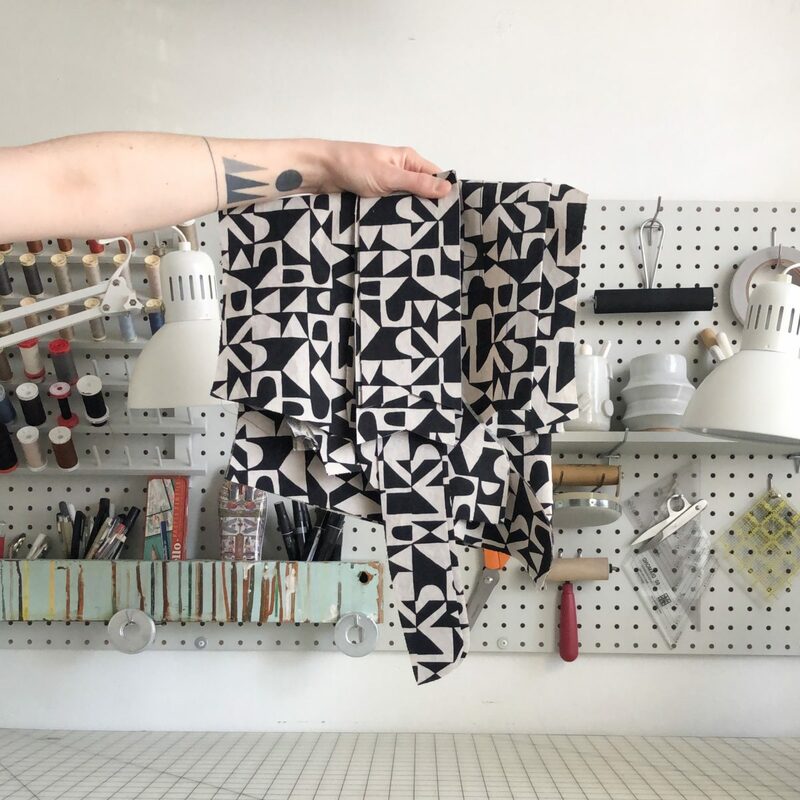 The sewing community and independent pattern designers are usually super helpful when folks ask questions, so don’t be shy if you run into a step that confuses you on any project – odds are someone has figured it out and they’d be happy to help! I’m really, really pleased with this make and know I’ll use it for a long time. I’m not sure when Sarah plans to release this pattern, but will definitely keep folks updated on Instagram. 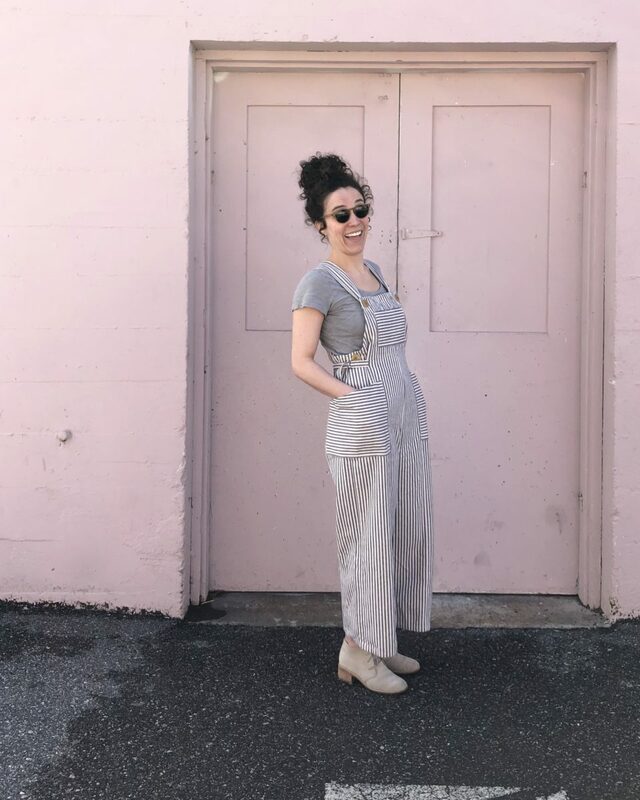 You should also follow Sarah Kirsten for the most up-to-date info on this pattern (and because her grid is lovely)! 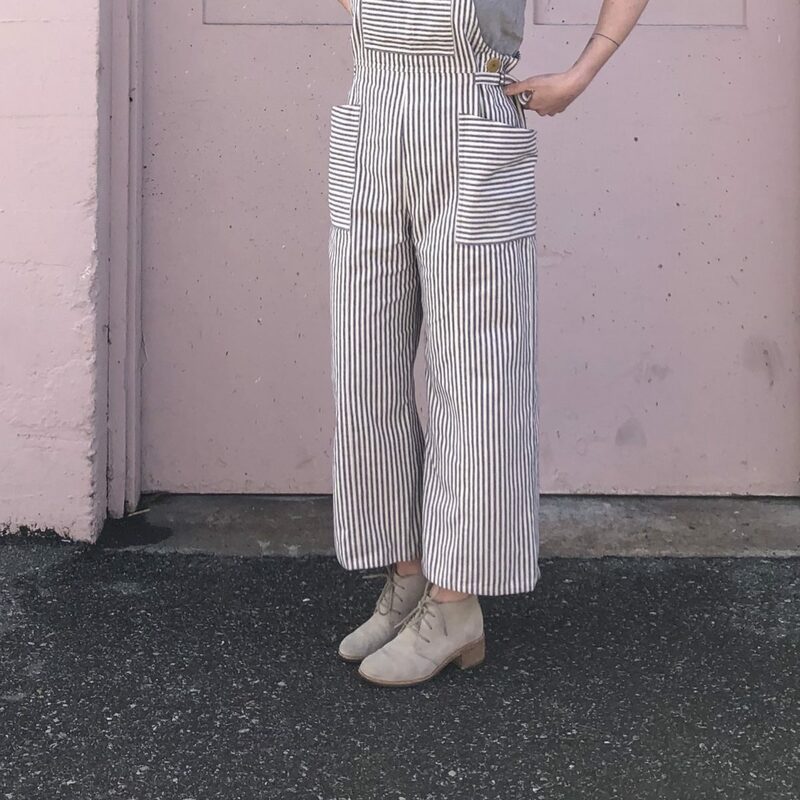 I love overalls, so when Janet from Decades of Style asked if I’d be willing test an overall pattern, I jumped at the chance. 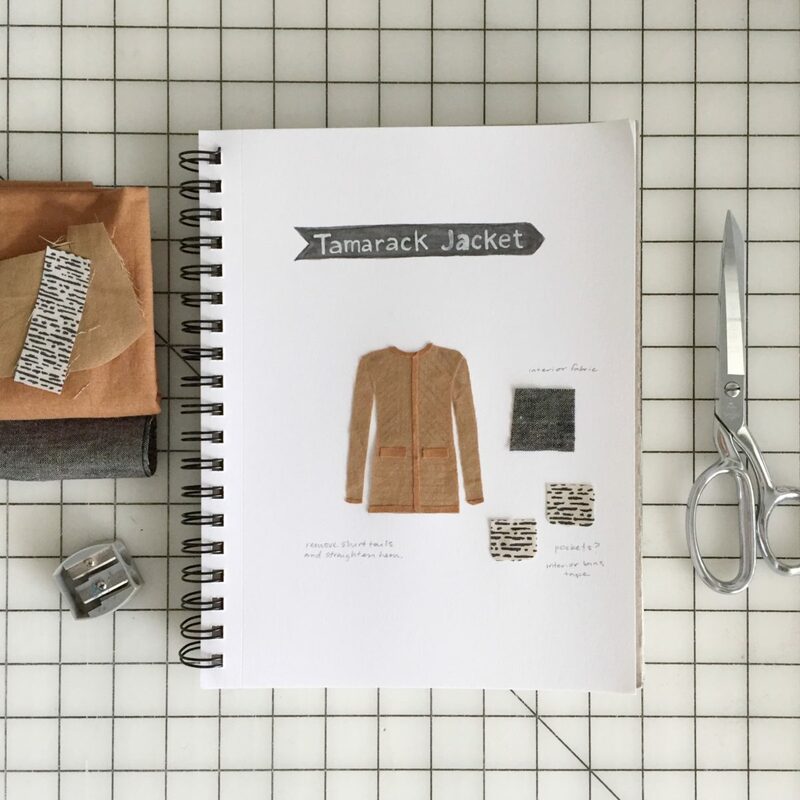 Plus, pattern testing for independent designers is such an enjoyable process! 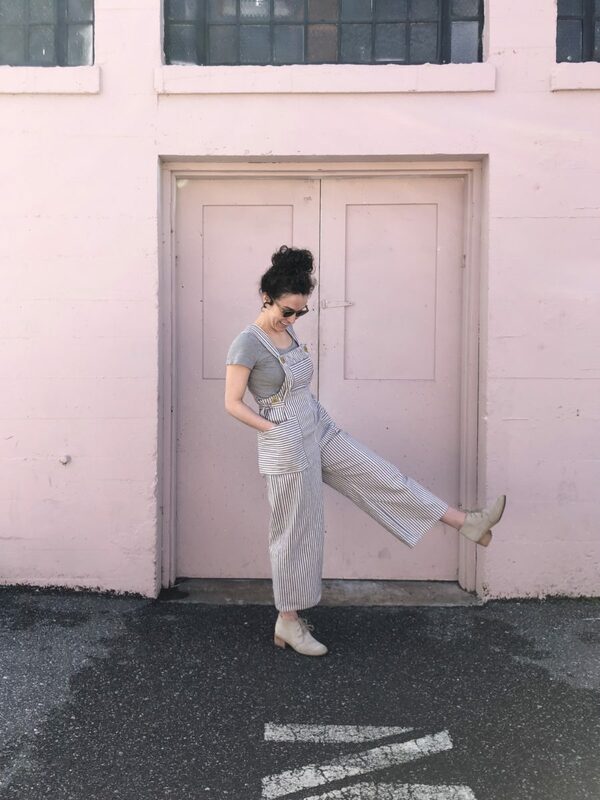 Decades of Style is a Bay Area pattern company specializing in bringing home sewists styles from the 1920’s to the 1950’s. 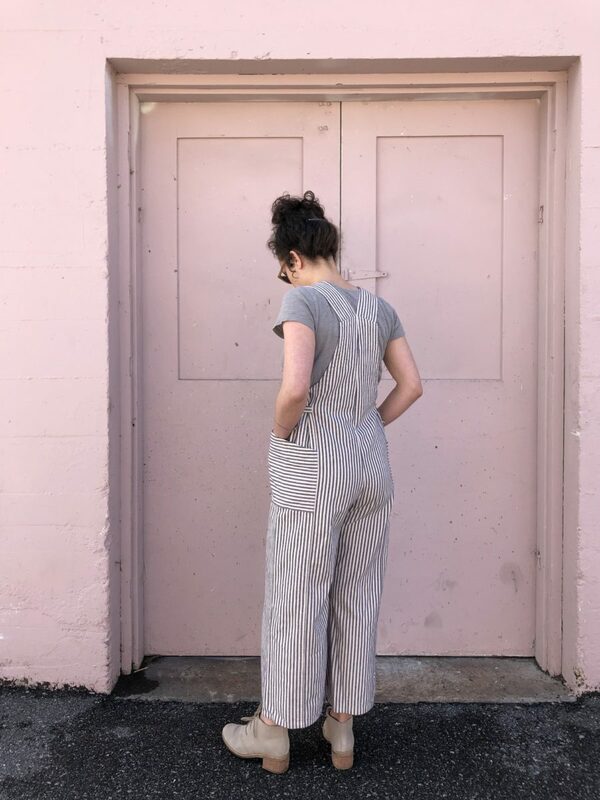 The Ophelia Overalls are part of their microline: Decades Everyday. 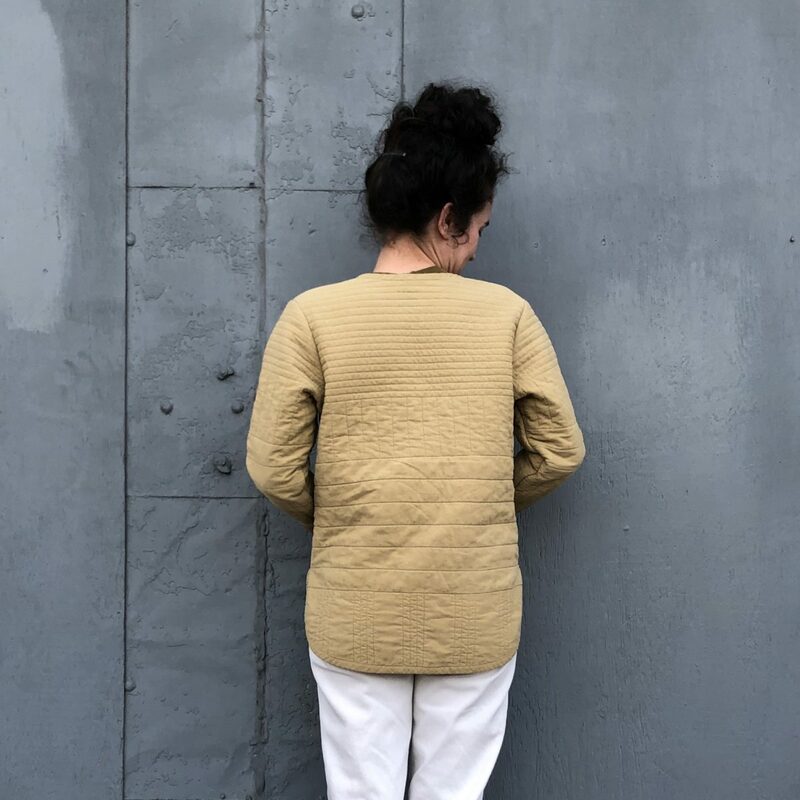 The line’s focus is high quality patterns, but with zippier sewing. And these did sew up pretty fast! 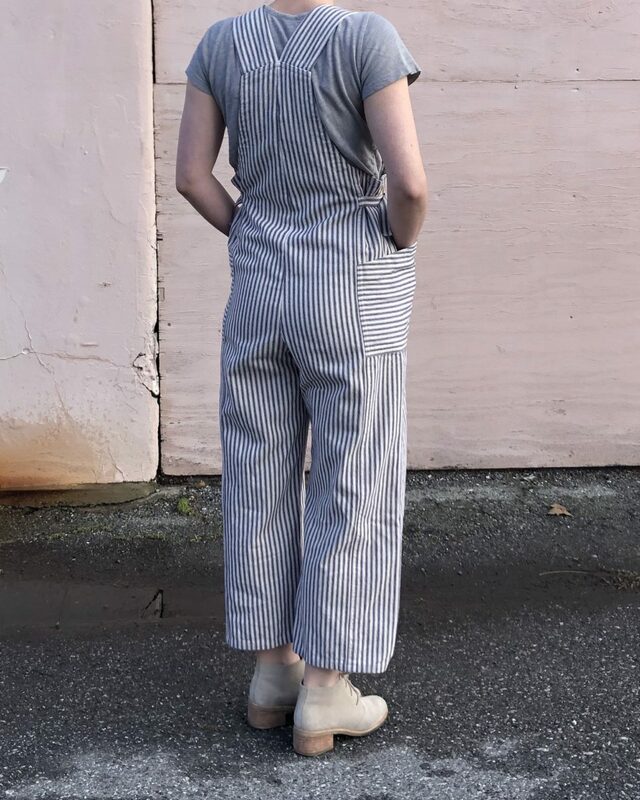 I’ve been wanting to make a striped pant/overall/jumpsuit for a while and thought this pattern would be perfect. 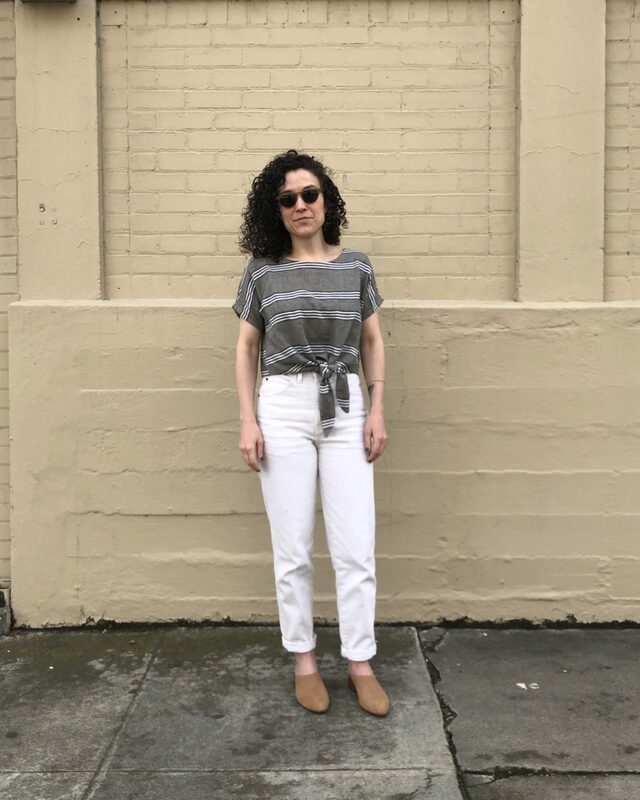 Initially I had wanted to use a lighter weight striped denim, but couldn’t find exactly what I wanted… and the timing just didn’t work for a trip up to Stonemountain. So I went to Joann Fabrics hoping to find a deal. I had to venture in to its Utility Fabrics section to find the stripe I’d envisioned, and ended up buying this pillow ticking! Before washing, it was really stiff but now it’s like walking around in a soft and drapey pillow case. Word to the wise though, if you plan on making a garment with pillow ticking it SHRINKS SO MUCH. The yardage I bought shrunk about 30%. It was insane and necessitated another trip to Joann’s. 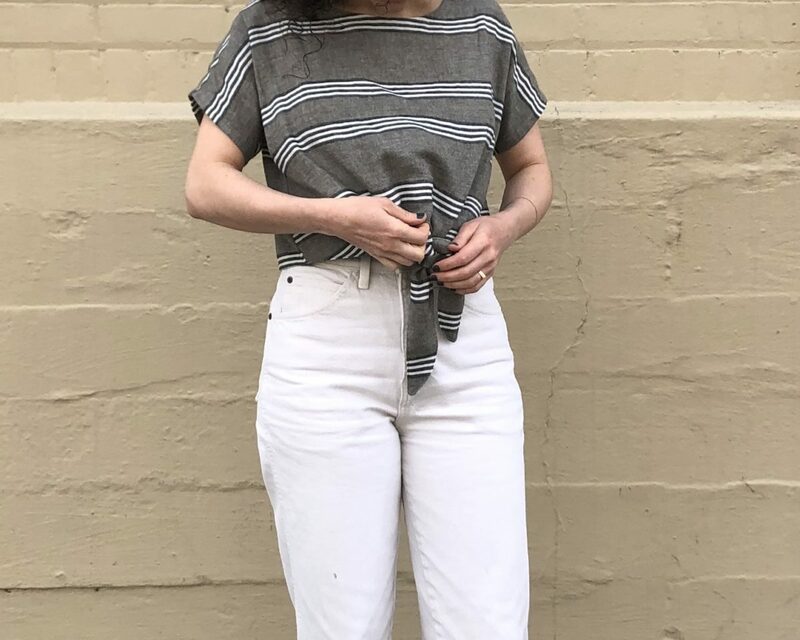 Well, after shortening the pant pieces by 4 inches, I was going to make it work on the shrunken yardage, but then I somehow managed to cut out one pocket the wrong direction. Gah! 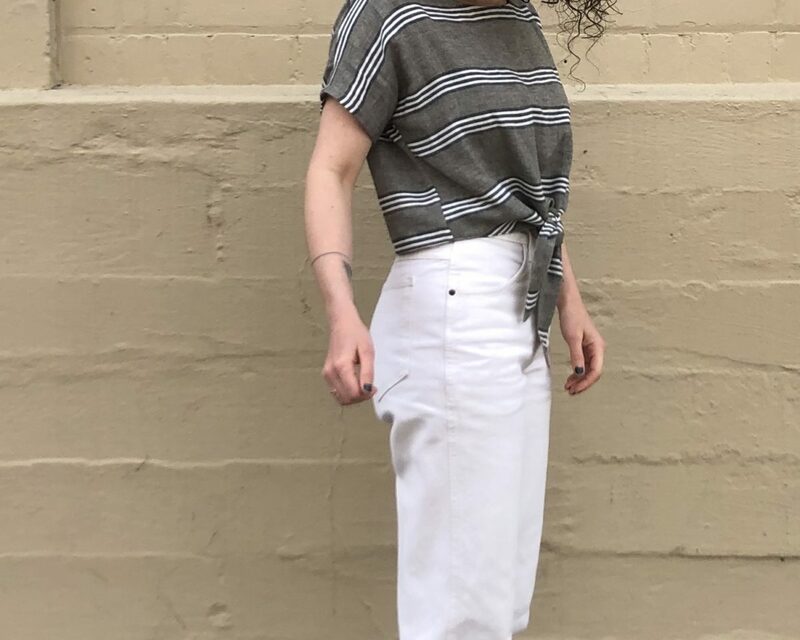 I made a straight size 8 (View A). View B has a “cleaner” finish and feels a little dressy. 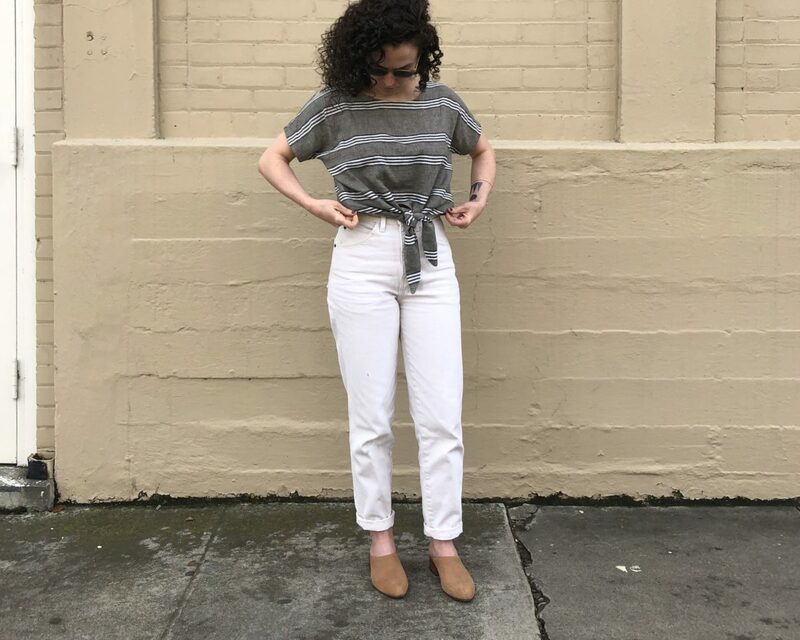 The only modification I made was to shorten the pant legs by 4 inches because I’m 5’2″. If I were to make these again I would also shorten the straps a few inches because there’s a lot of extra strap dangling behind the bib. The pant legs are divided into four pieces so the pocket edges fit neatly into the seams. Each side has a button and snap closure, but I’ve found that at least on me, I never have to undo the snaps or bettons to get in and out. I just have to loosen the side belts and wiggle! 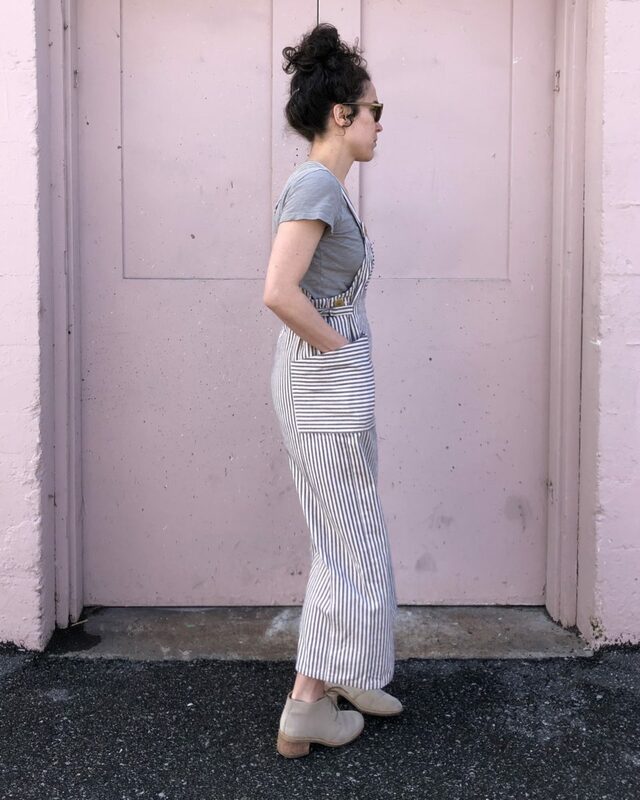 Both views feature side belts that allow you to cinch the waist. 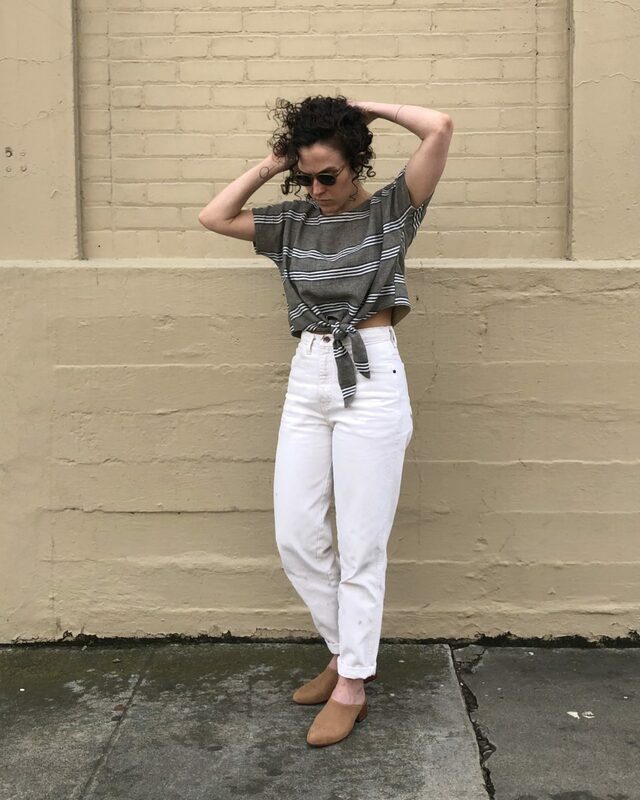 I’m toying with the idea of making a version without the belts for a super relaxed fit. I’ve been wearing these at least once a week since finishing them. 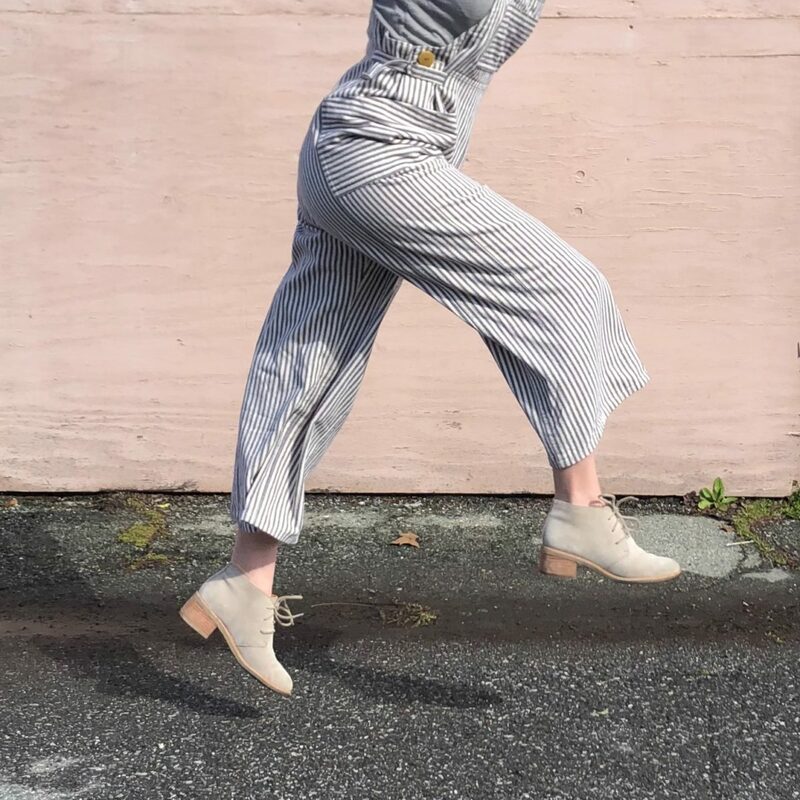 If you’re looking for an overall pattern that has 1940’s Land Girls vibes, these are for you! 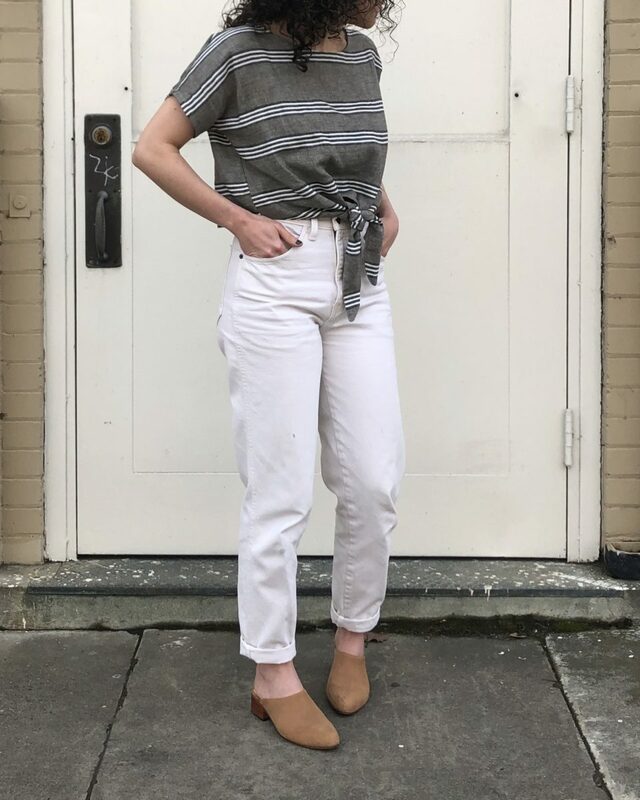 Decades of Style is offering 20% off your entire purchase with the coupon code: OVER20 for the next two weeks! 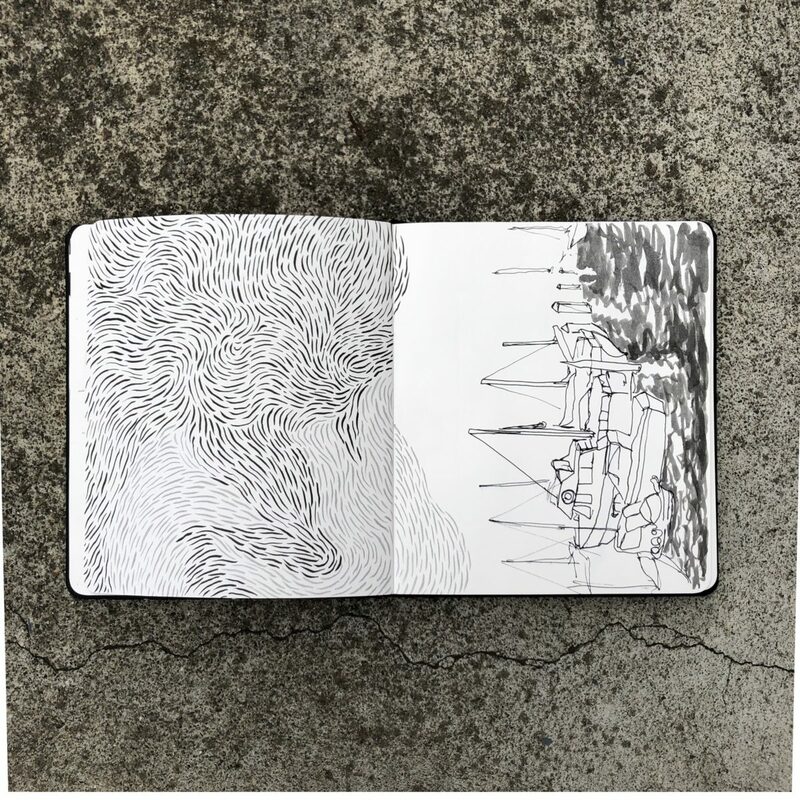 Since I started logbooking, my sketchbook practice has pretty much come to halt. I started my second Shinola back in May of 2018 and I’ve only filled about a third of its pages. 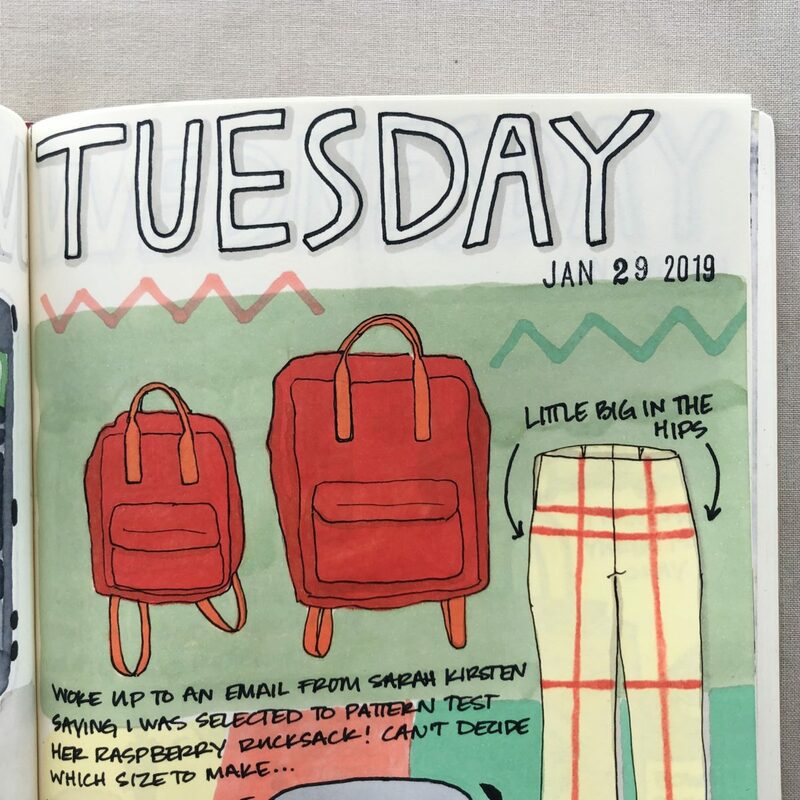 This past week I definitely started to feel its absence, so I brought my sketchbook to work and in my more independent/chill classes, I worked alongside my kids. It feels good and I’m hoping I can find a balance moving forward. Learned how to create some shapes this week. 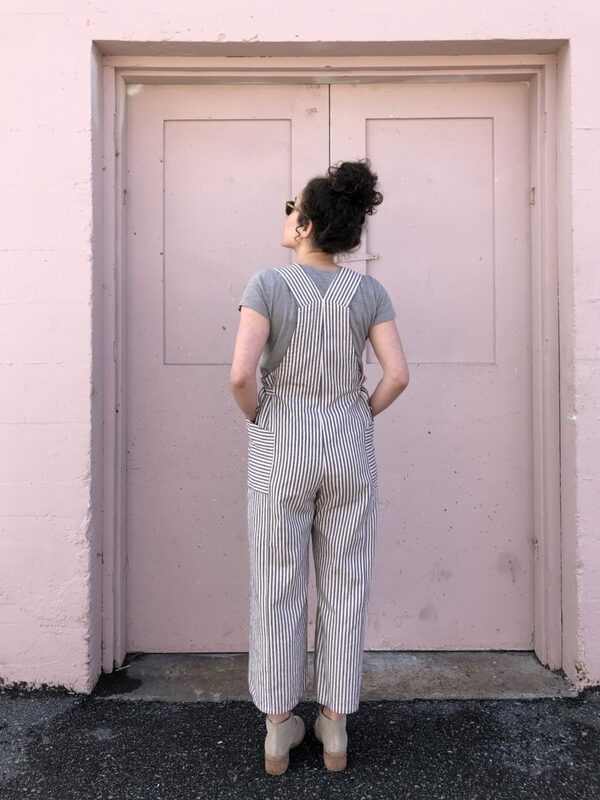 When I was first learning to sew, I painstakingly made one thing at a time, from start to finish. . . very, very slowly. My skills and brain just couldn’t handle juggling more than one project. I had a big fear of making mistakes, or ruining my sewing machine (? ), or I assumed I didn’t understand the instructions. Little by little, I started to realize that things didn’t need to be cut out perfectly, seam rippers are there for a reason, and that instructions don’t disappear if you start a different project. It appears that increased confidence sometimes comes with haphazard making. There are FOUR (it’s actually more) WIPs / UFOs that I’ve been bouncing between for months. I kind of miss the extreme focus I used to dedicate to each project when I first started. So I’m doing a WIP Check and declaring a moratorium on starting anything new until these four are finished! 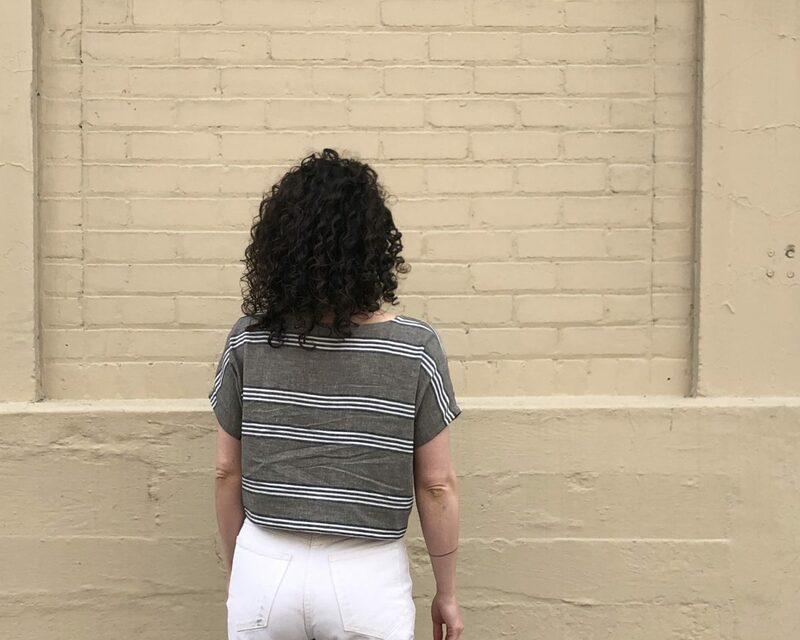 I planned this shirt in March of 2018, cut it out in May, actually started sewing it in June, and. . . haven’t touched it since. It needs one side of the button placket, the sides, cuffs, and collar. I don’t even know when the plan for this happened, but it was a LONG, LONG time ago. 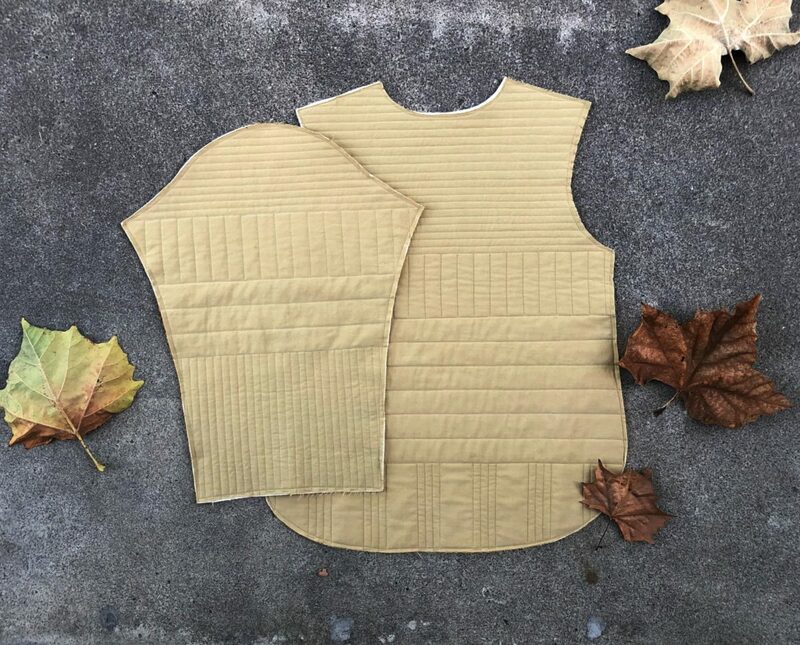 I cut it out on September 3rd and finished quilting it on October 14th, 2018. I installed one welt pocket over the weekend and plan to finish this WIP first since it’s still chilly jacket weather! 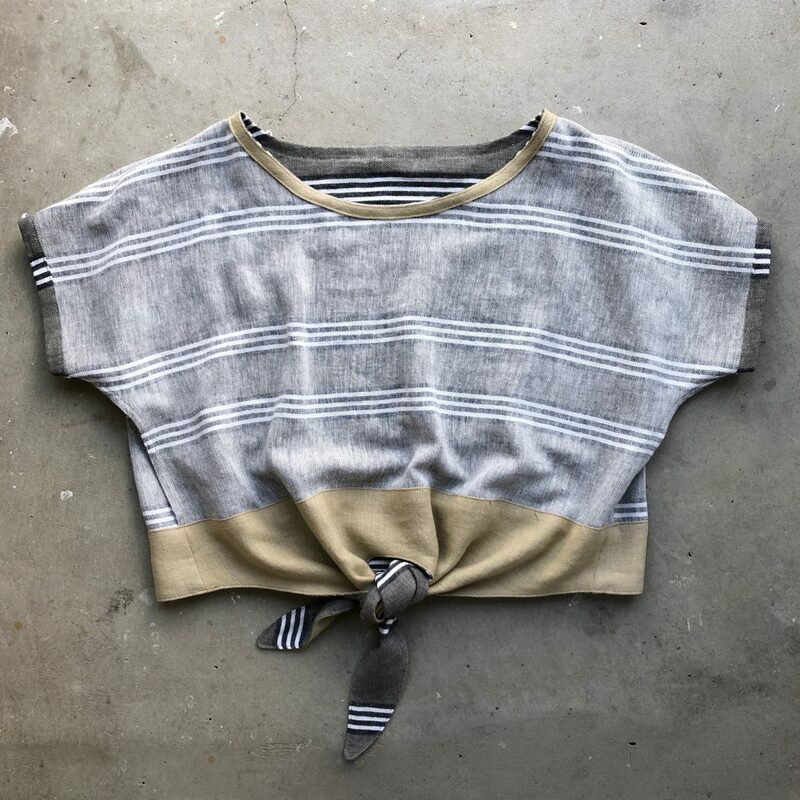 The idea for this Wiksten Haori came when Stonemountain started carrying this Canyon Stripe Linen/Cotton fabric. The lining is finished, just need to cut out and assemble the exterior. I’m not sure this hack is going to work out, but I’m going to push through because I used really nice fabric. Just need to sew up one leg, the crotch, waistband, and hem. 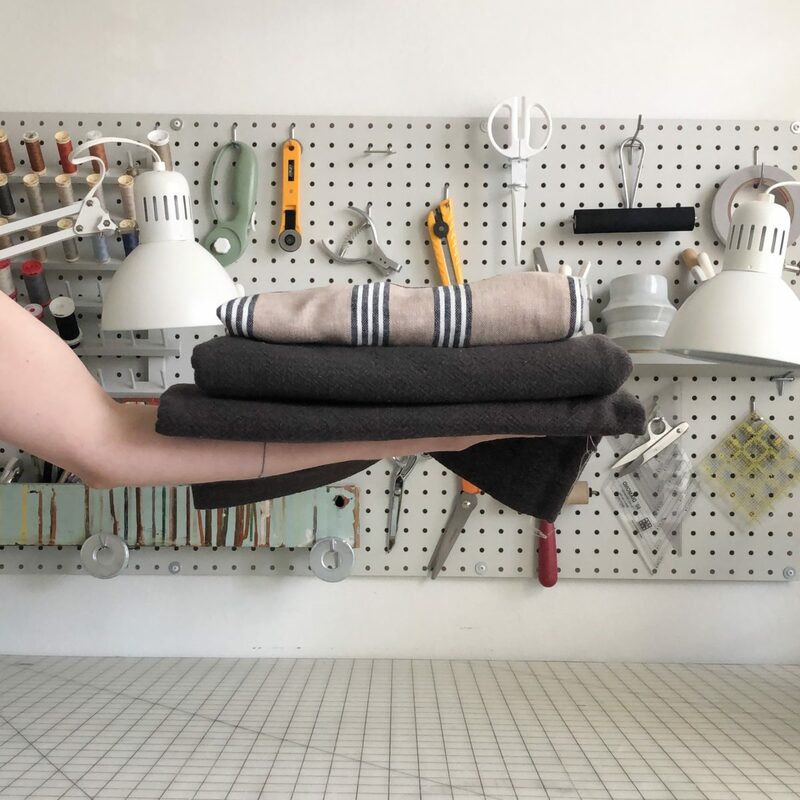 Are you a one project at a time sewist, or do you juggle? Hi 2019! You’re the year I’m going to figure out Adobe Illustrator! 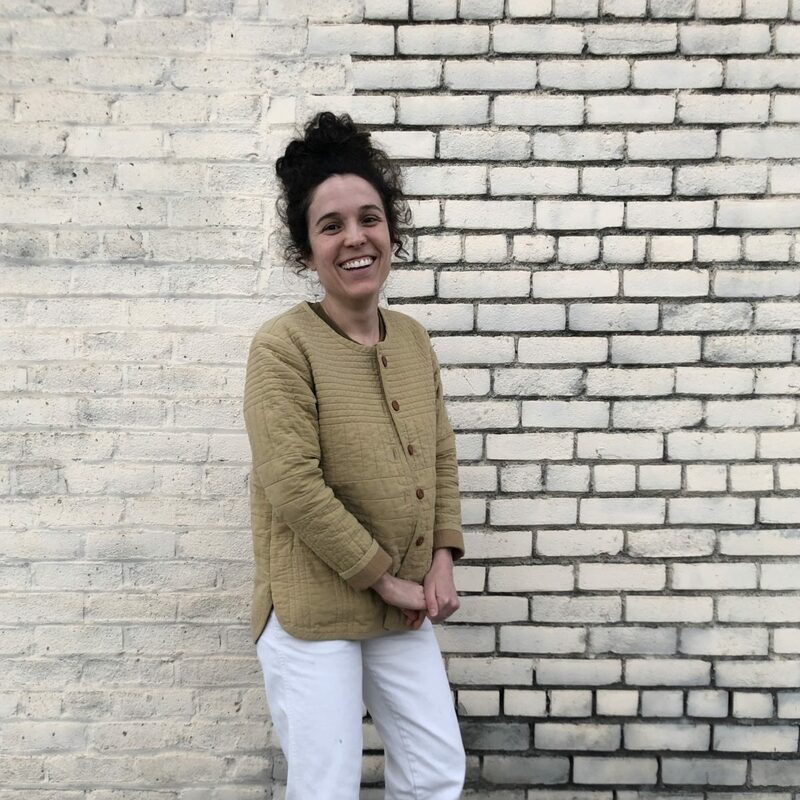 There are two main reasons for this goal: The first is I need to diversify my skills for that impending career change and the second is that I want to design and potentially even produce my own line of fabrics. First (almost) independently made repeat. My mom had to help get it into my swatches. As the child of two graphic designers, I really missed an opportunity to learn this software well before my 30s. But, that type of thinking won’t help me now, so while I was home for the holidays, I sat down with my mom for several in-person tutorials. It is a powerful and imperfect software. Aside from there being a million different ways to do one thing, it has some annoying glitches. It was actually a little comforting to see my mom, a person who has used the creative suite for many years, occasionally struggle to make a thing happen on our computer screens. 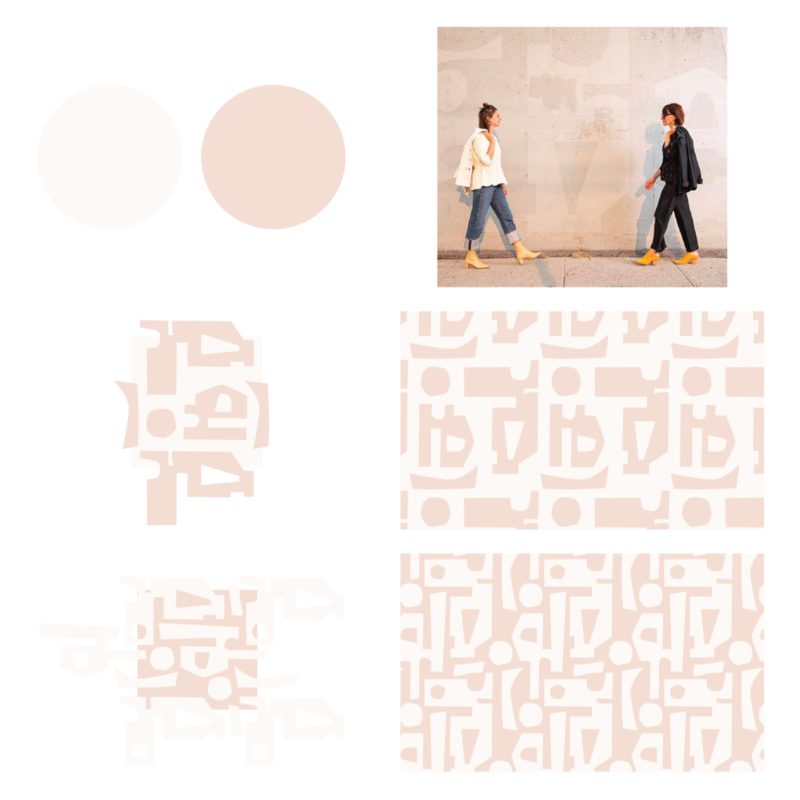 But, with just a few curse words and a lot of ⌘z’s, I was able to get the basics down for creating repeat patterns! 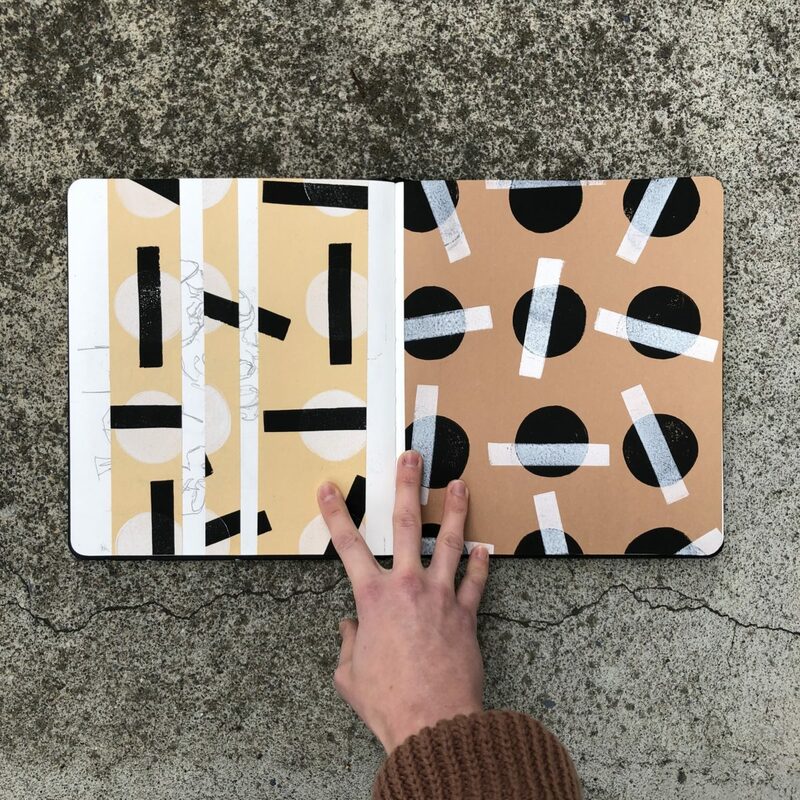 In the name of learning, I’m going to challenge myself to create one repeat pattern a week for 10 weeks and share them here on the blog. I’m having a Repeat Pattern Party! Will those 10 repeats lead to a fabric collection? Maybe. Hopefully. But honestly, this self-imposed challenge is going to be focused on learning to navigate the software with some ease.